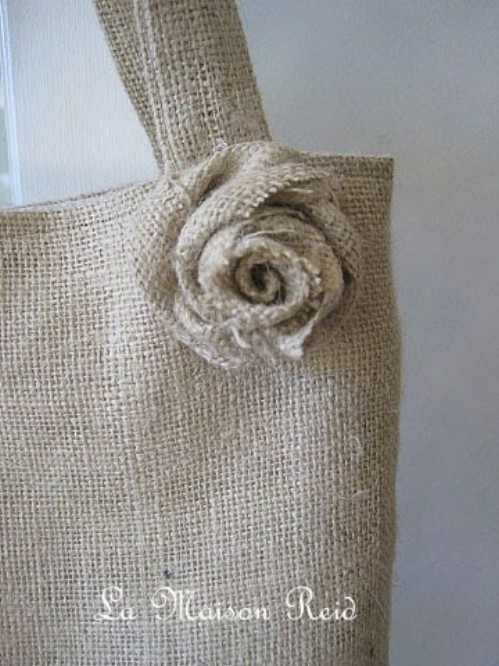 Burlap is a very popular material and one that gives you many craft possibilities. If you are looking to add a bit of rustic to your home or you simply like the look of burlap, there are so many things that you can make! We have collected a list of 100 easy DIY projects that you can make with burlap. 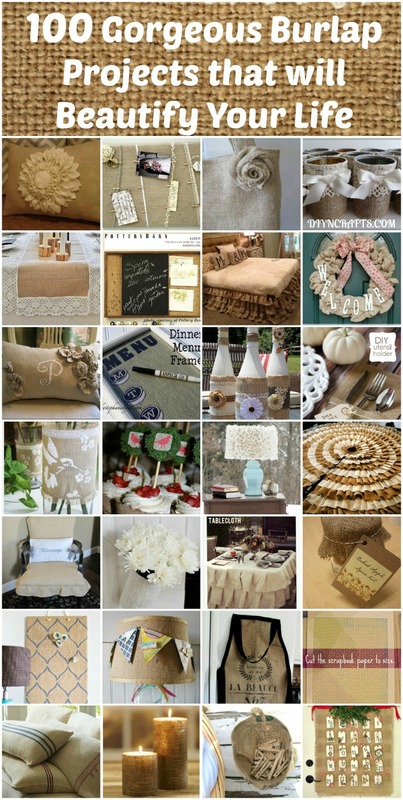 From bed skirts and curtains to pillows, picture frames and even wedding attire, you can easily put together these burlap crafts and decorate your home or give them away as gifts. Burlap is easy to find and relatively inexpensive (think potato sacks) or you can purchase it from your local craft store and it comes in a wide variety of colors these days as well so even if you don’t generally like the brownish color, you can find other colors to complete your crafts. Grab that burlap and get started on one of these amazing projects. 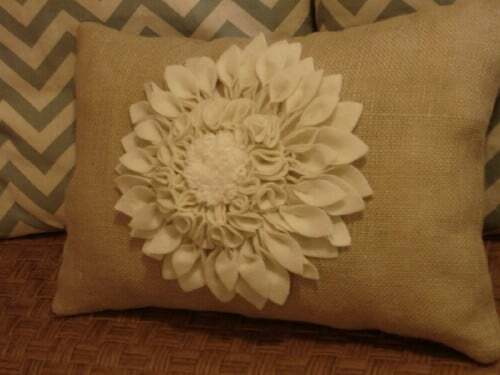 This little pillow is the perfect way to add a little rustic charm to your living room or bedroom. Whether you have it on the couch or use it as a decorative bed pillow, it is lovely and really simple to make. The felt flower is the most complicated part but even that is relatively easy. You just need enough burlap to create the pillow and then of course, the stuffing. This is so easy that you may want to make several to line your couch and you can alter the size to fit your specific needs. This is a great project that is perfect for keeping photos or even notes. 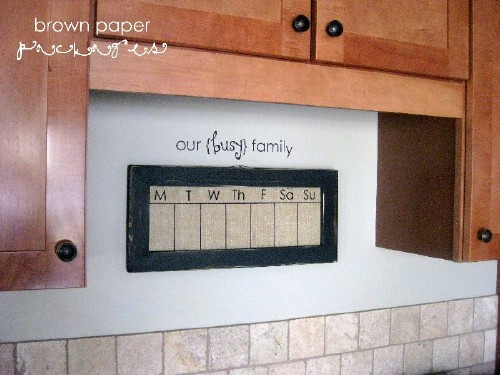 You can hang it in the kitchen and use the clothespins to hold notes about schedules or important events. You need to purchase a canvas, which you can probably get at your local Dollar Store and you’ll need ribbon or other fabric trim to hold the clothespins which hold your photos or note cards. You can actually put this entire thing together in less than an hour and it’s great for holding recipes or just anything that you want to put on it. You just can never have too many tote bags and this one is made completely of burlap, right down to the adorable shabby rose on the side. You can actually put the rose anywhere you want but it looks great right next to the strap. Note that you’ll need fabric to cover the inside unless you really do want it completely from burlap. There is also a bit of sewing required but even for beginning sewers, this is a great little project that won’t take up too much of your time and will give you a beautiful tote that you can use at the beach this summer. 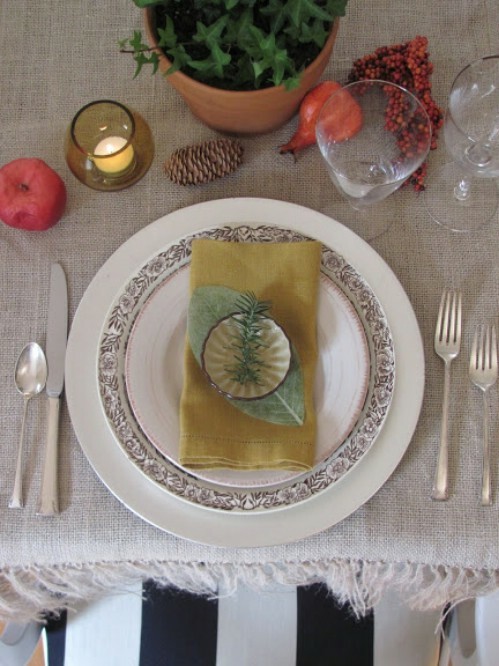 What a beautiful way to dress up a fall table! 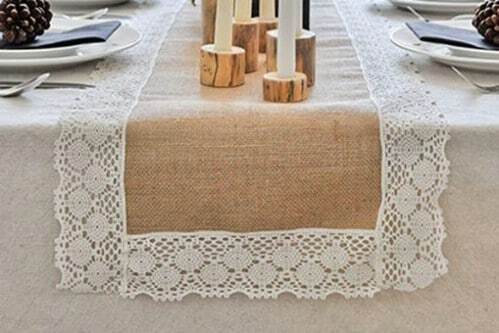 This lace and burlap table runner is as easy to make as it is beautiful. You can use it during other seasons but it will be perfect for those fall dinners and even Thanksgiving. It’s such a simple project, too. You just have to cut your burlap and then add the lace. You can make it wider by adding wider lace or just add a thin lace border to make it smaller. You can also toggle the length to fit your specific table length and this would be great even for coffee tables or dressers. 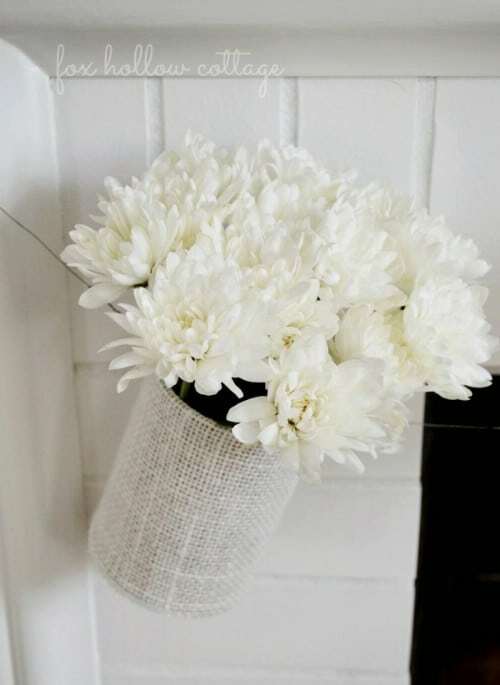 This beautiful vase is actually made with an upcycled tin can. You just clean the can thoroughly and then glue the burlap all the way around. You’ll have to cut the burlap to ensure that it fits perfectly lengthwise and then top it off with a lovely satin or lace ribbon. You could also crochet a topper and run the ribbon through that. These would be great for weddings to hold flowers on the table or you could just have a few of them sitting around the house this summer holding lovely wildflowers. A little hot glue will hold the burlap and ribbons perfectly in place. Imagine the rustic look that your home will have when you create these lovely burlap curtains to hang. Whether you want something in the bedroom, living room or even the dining room, you can make these pretty quickly and there is no sewing required. They cost only about $7 per panel which is much cheaper than store bought curtains and these are so much more unique. If you want, you could embellish them a bit with different things or they look great without anything added. This is a great Pottery Barn knockoff that would be perfect for keeping family messages organized. It has a chalkboard for writing messages as well as burlap for pinning up notes, recipes or anything else you need to keep handy. 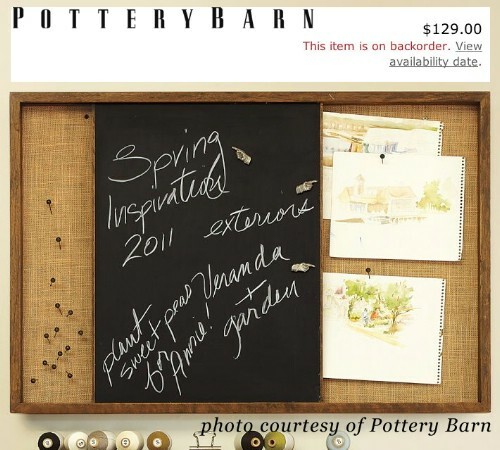 The original piece from Pottery Barn (which is no longer available) was over $100 but you can make this yourself for around $10, depending on what you have on hand for the project. We realize it’s a little early for Christmas projects, but this one is so cute that it just had to be mentioned. 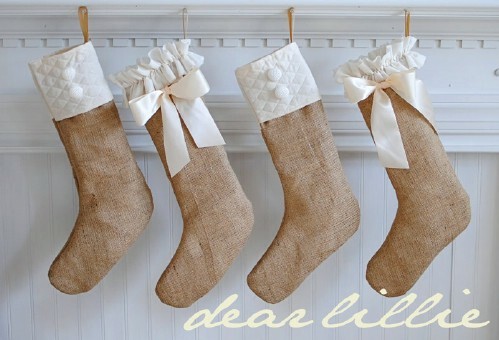 If you want to decorate in a rustic look this coming Holiday, these burlap stockings are absolutely perfect. Just measure, cut, sew and then embellish with whatever you want. The un-hemmed ruffles on these are adorable and really give them that rustic country look. You could do as many of these as you need for your mantel or imagine adding them to your porch decorations. 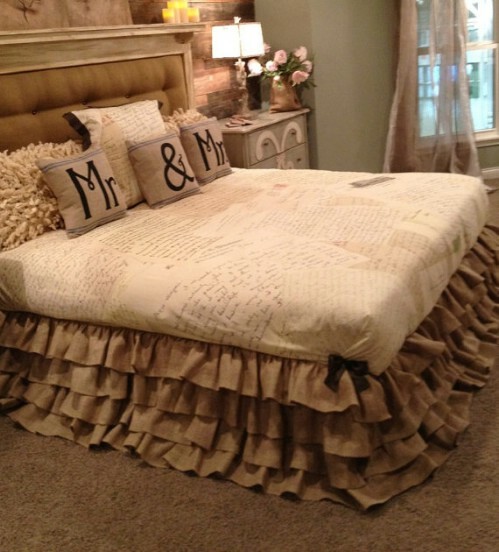 This great bed skirt has loads of ruffles and is perfect in burlap for those of you looking to add a real rustic feel to your homes. The skirt is actually much easier to make than it looks and you can create one in king or queen size based on the instructions. You could also probably cut it down if you needed a full or twin sized bed skirt. The little bows on the corners are really cute and imagine how this would look with a few burlap decorator pillows on the bed. This menu is certainly going to dress up your kitchen and it serves such a handy little function. You can keep track of all of the meals that you are planning to make for the week. This lets you know that you have everything you need on hand and keeps all of your dinners perfectly organized. The project itself is really easy and you can use whatever color schemes you want so that you can match it perfectly to your kitchen décor. These would also make wonderful gifts. 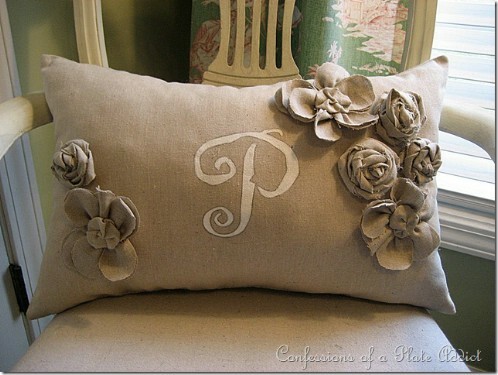 This gorgeous monogramed pillow is perfect for any bedroom and comes complete with a lovely bouquet of burlap flowers. If you already have the burlap and filling on hand, this one won’t cost you anything, which is a lot cheaper than Pottery Barn versions that can run nearly $50 with the monogram. You could do these in a smaller version as well to dress up the bed or even a couch if you want and they take very little time to complete. You can create both a burlap shower curtain and adorable hangers to match and all without a stitch of sewing required. This little project uses fabric glue and an iron to keep everything in place. The clothespins between the curtain hooks are a nice touch and makes the entire bathroom look really rustic and old-fashioned. 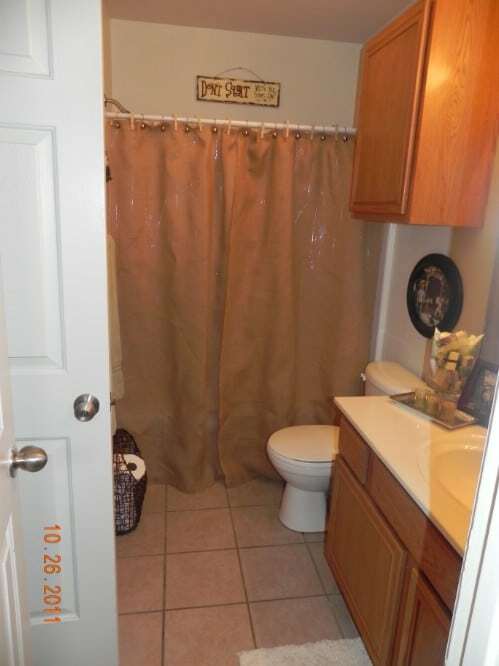 This is a great look for any bathroom and you only need about 5 yards of burlap to complete the entire thing, so it’s really easy and really inexpensive, especially if you already have a few yards of burlap on hand. You can make this great Anthropologie knock-off hurricane lantern with a bit of burlap, some garden twine and jute rope and a few other supplies. You will need a container to create the form but you can recycle an old iced tea gallon so if you have the other supplies on hand, this one won’t cost a cent. These are great for decorating your outdoors and are really easy to make. You can do several of them and really entertain on the deck in style this summer. You can create this lovely burlap wreath and make different decorations for it so you can leave it hanging all year and simply change it a bit to match each season. The wreath itself takes very little time to create and you need very few supplies. 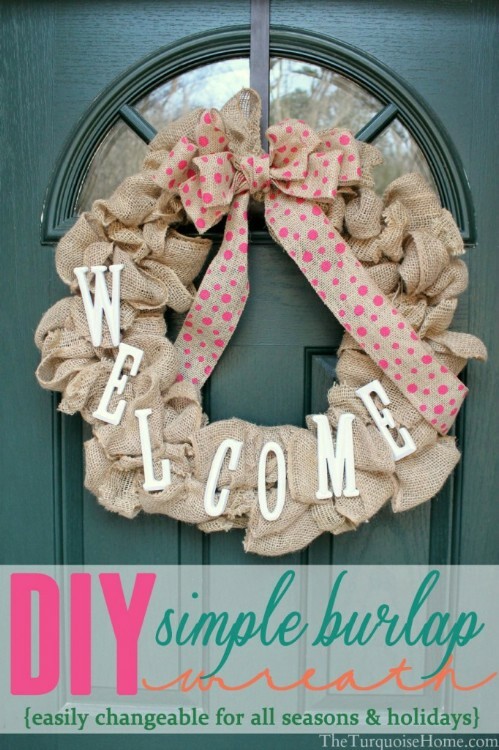 You just apply the burlap material to your wreath form, or you could make it from wire if you prefer, and then add whatever decorations you want. It takes several yards of burlap depending on how full you want the wreath to be and you can add wooden lettering or other embellishments using floral wire. These little planters are easy to make and the perfect way to display your lovely spring flowers. After you have planted your flowers in the coco fiber liner, you simply “wrap” it all up in burlap and add a ribbon or bow. You can sit these directly on the ground or keep them on the porch if you want something to dress up your curb appeal just a bit. They are easy to do and look beautiful when you have several of them grouped together. This great valance looks really expensive and really elegant but you can make it in just about an hour and it costs very little to create. 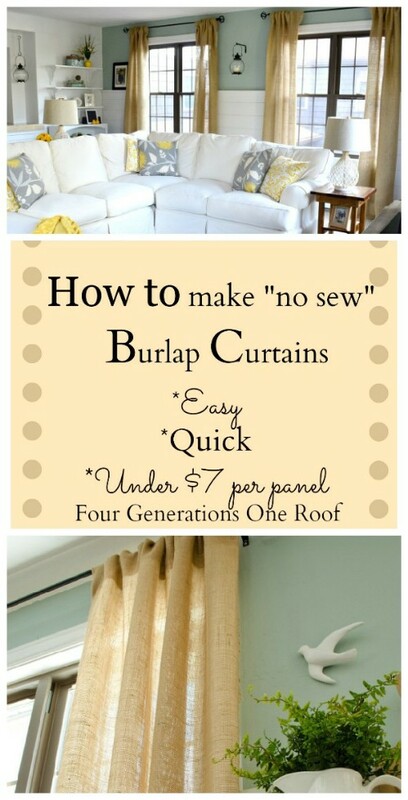 You basically just have to measure the window, cut the burlap and then hang it on the window. 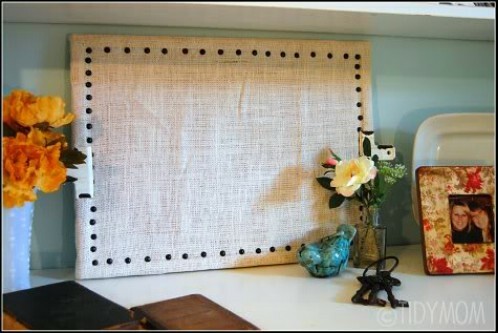 You can use thumbtacks to secure it into place and the burlap will perfectly hide the tacks so they won’t be seen. The frayed edges look great on the bottom and you just have to place ties of some sort wherever you want them to raise the valance however you prefer. 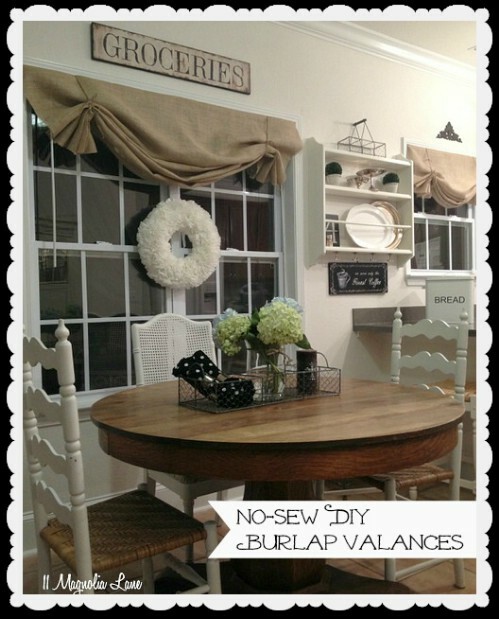 This great burlap bulletin board is super easy and really inexpensive to create. You just need a cork board, which you can pick up at your local Dollar Store for very little, a staple gun, a few upholstery tacks and a yard of burlap. 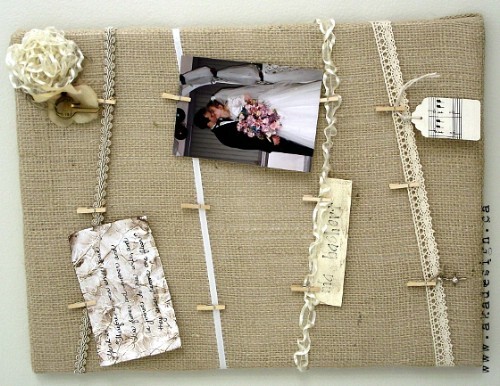 You just cover an ordinary cork board with burlap and then use the upholstery tacks to give it a bit of decoration. This is great for kitchens and takes very little time to put together. Keep your recipes, bills or whatever you want pinned up here and remind yourself of important tasks in style. 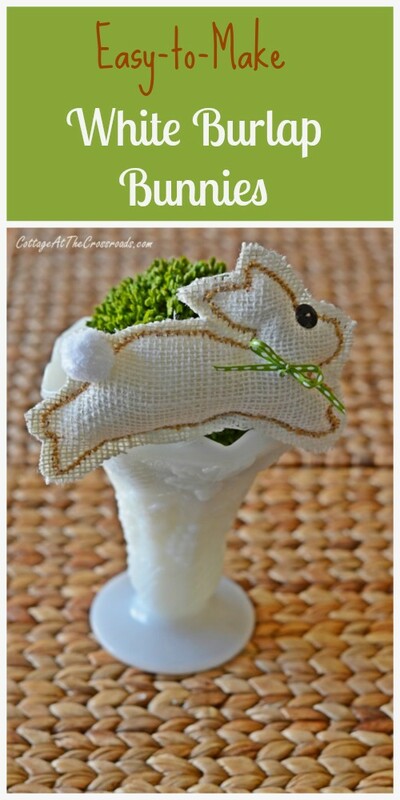 Whether you are looking for a really unique project for Easter or you just absolutely adore bunnies, you are sure to love this easy burlap bunny project. Note that you don’t really have to do these in white. If you prefer natural burlap (or any other color for that matter) you can use whatever color you prefer. You just have to cut the bunny form out of the burlap, hand stitch it and remember to fill before you close it up. These would be great for homemade Easter baskets or just anywhere you want a whimsical and really cute decoration. 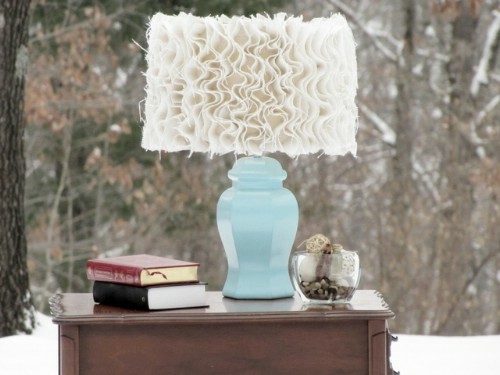 You only need about a yard and a half of burlap to create this beautiful ruffled lampshade, which would look perfect in any room in your house. You can use an old lamp base that you already have or pick one up for a buck or two at your local thrift store or a yard sale. Then just paint the base whatever color you want and get to work on your Anthropologie inspired shade. You don’t even have to sew this one. You can use fabric glue to keep the ruffles together, making it as easy to create as it is beautiful. Don’t wait until fall to begin creating these adorable little burlap pumpkins, which you can do in a load of different sizes. These are great for fall decorating inside or out. There is a bit of sewing involved to make them but they are much easier than they look and you can do them in different colors if you want to create a really colorful and bold display. 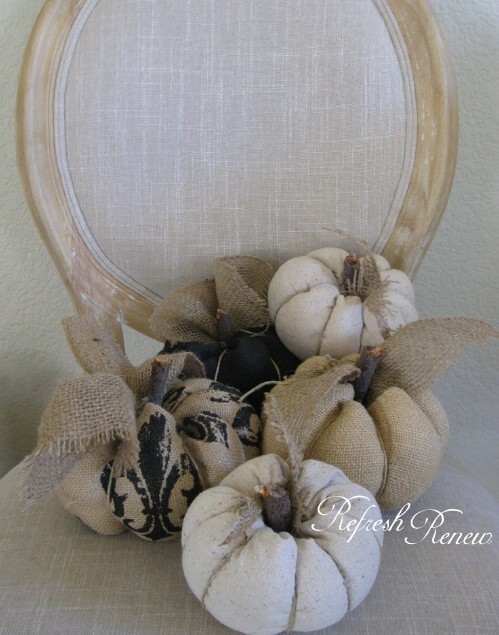 You could even decorate the burlap a bit with sharpies or other markers before you make them into pumpkins to create a really unique display. 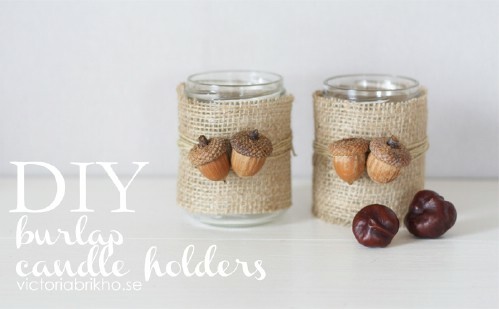 These little utensil holders are the perfect things to dress up your Thanksgiving dinner table. Of course, if you don’t want to wait until Thanksgiving to use them, they are also great for summer get-togethers. They are very simple to make and you don’t have to sew anything. You can put them together with a hot glue gun and then just add the adornments or name tags or whatever else you want to decorate them. A little piece of twine is perfect for adding names or any special message you want to share with your dinner guests. 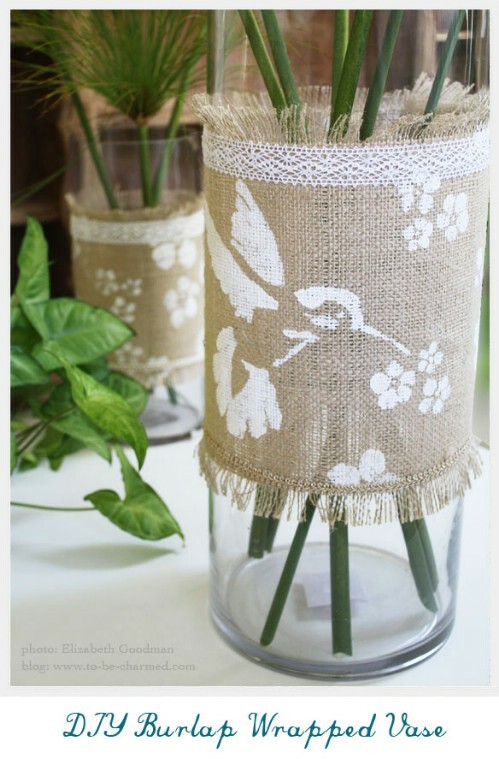 Just a strip of burlap, a plain glass vase and a little lace will help you to create these beautiful burlap wrapped vases that are great for weddings or for anywhere in the home. You can easily stencil images or words onto the vases with white paint and then use white lace to tie them together. You can cover any vase and even recycle wine bottles or just about anything else that you want to turn into a vase with this project. It’s quick and easy and costs very little – nothing at all if you have a little burlap and other supplies on hand. This flag is a great project if you want something a little unique hanging in your home or you could use it as an outdoor flag as well. You just have to cut the burlap to the size that you need, add whatever message or image you want with stencils and then add some jute rope to hang the flag. This entire project will take less than an hour (depending of course on what message you want to use and how you apply the words) and won’t cost anything if you have a piece of burlap and some paint handy. Burlap lined cupcakes are a great idea for weddings or just anytime you want to add a little something special to your yummy cupcakes. 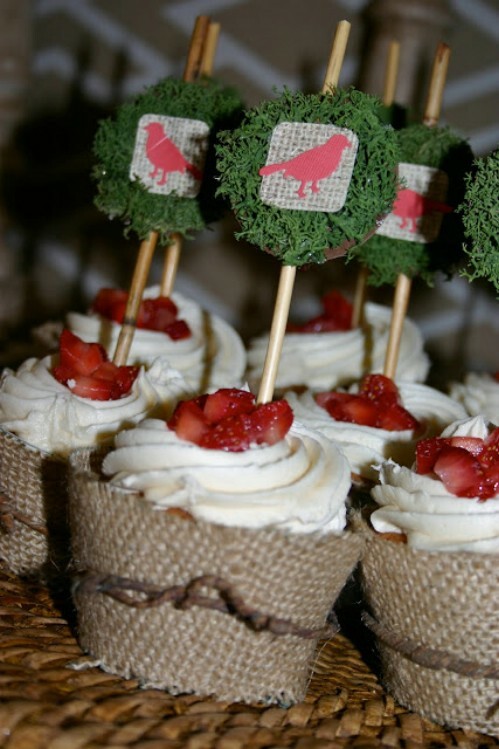 If you are planning a burlap themed wedding, these would look great next to your wedding cake. You just have to glue the burlap onto a cupcake wrapper template and then sit the cupcakes down into them. You can add any type of decoration that you want although a simple jute or twine tie looks great right through the middle. These little candle holders will be perfect for fall decorating but they’ll look great during other seasons as well. 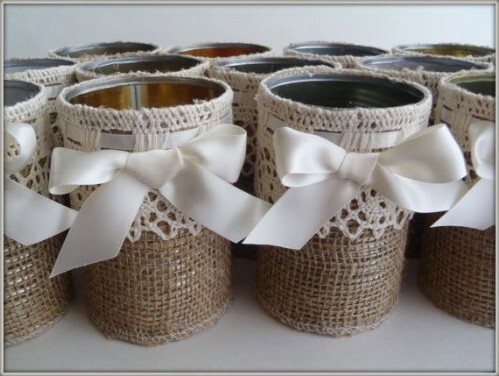 You just have to cut burlap to cover glass candle holders (or any glass container for that matter) and then decorate them however you want. Acorns look great across the front center but you can use your imagination for the decorations. You just wrap the burlap around the jar, glue it into place and then add a twine ribbon in the front to make it look really great. 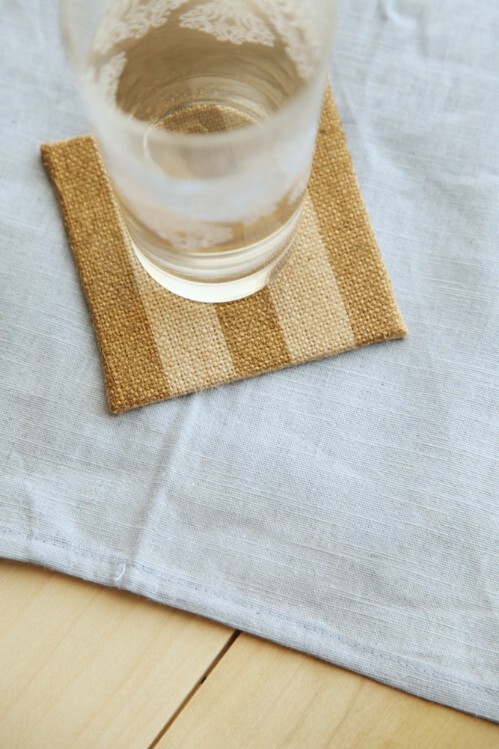 Burlap coasters are great for inside or outside. You can use these to dress up your summer outdoor dinner parties or keep them inside to keep liquid from getting onto wooden surfaces. The great part is that they are really easy to make. If you have just a bit of burlap fabric on hand, these won’t really cost you anything at all. You will need squares from some sort of material to create the basis for the coasters and then you just add the burlap and decorate them however you want. Painting works well and you can paint directly on the burlap. 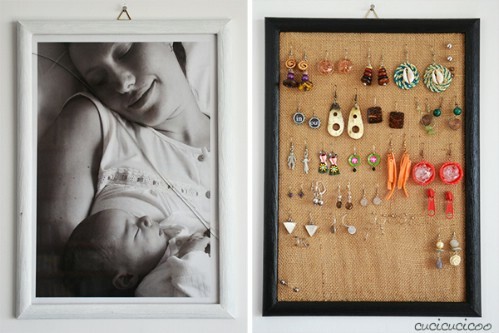 This great earring display is made from burlap and set in a picture frame. It’s really easy to make and you can pick up picture frames for around a dollar each so it’s also very inexpensive. 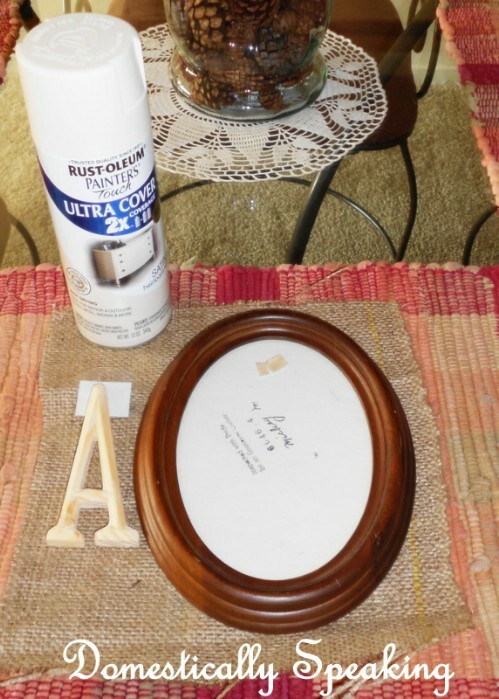 You just have to staple the burlap to the frame’s matting and then paint the frame whatever color you want. Earrings that have fishhook closures will slip right into the burlap and you can put other types of earrings in here as well. Take some time to customize it just a bit and this would make a wonderful gift for someone who has more earrings than they know what to do with. 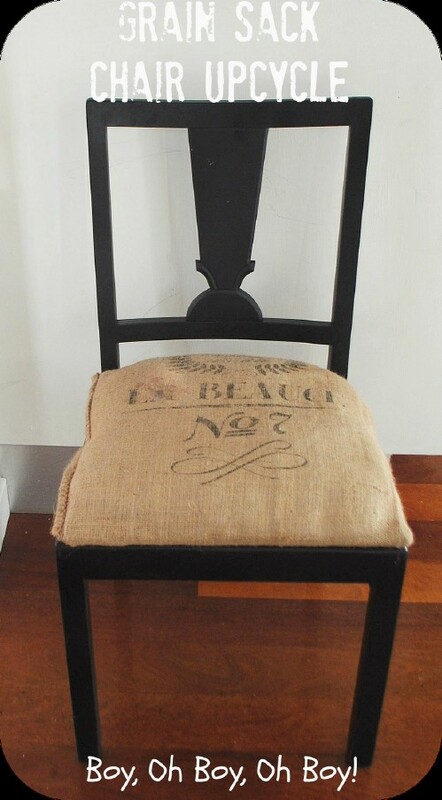 Give an old kitchen chair a great makeover by covering it with burlap. Even if you don’t have a lot of experience in reupholstering, this is a fairly easy project. You just have to cut the burlap and then attach it to the seating area, covering the old fabric or you can remove the old piece first. If needed, you can also add a bit more padding to make the chair much more comfortable. 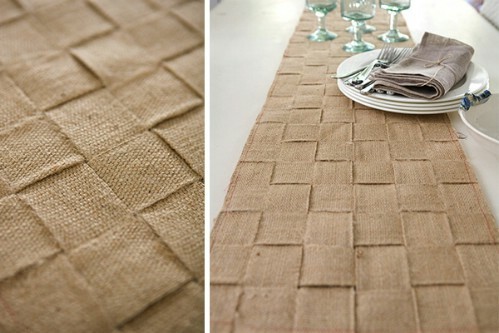 This is a great weekend project, particularly if you want to recover all of your kitchen chairs in burlap. For just one chair, it shouldn’t take more than a couple of hours. Whether you have an old corkboard that you want to cover up or you want to pick one up at your Dollar Store (they’re about a buck each), this is a great project that gives a little boost to an ordinary memo board. 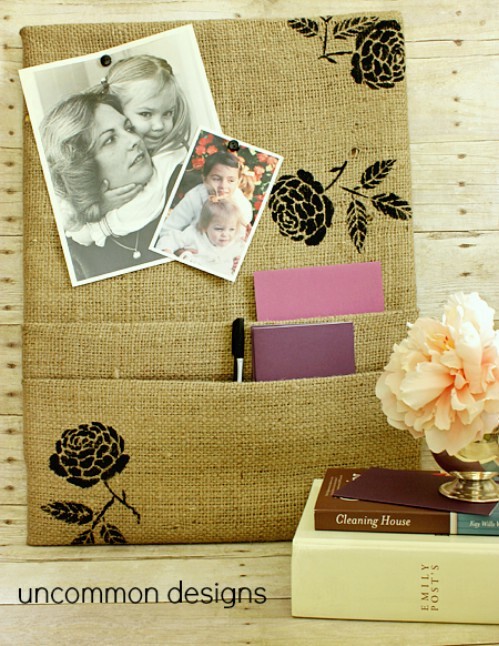 The burlap is folded in certain areas so it will perfectly hold photos or letters, whatever you need to put in there. You can use thumbtacks to hold things on it as well so it really works to help you keep organized and the little pockets are very convenient for those on the go. Sachets are great for adding to dresser drawers and keeping your clothes smelling wonderful. 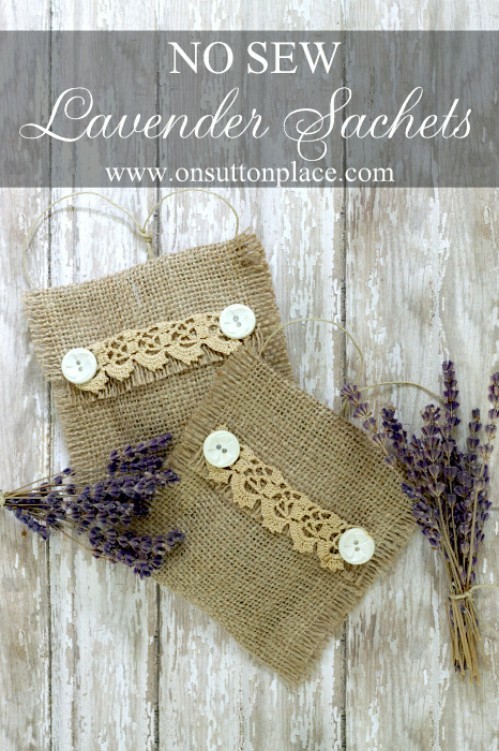 These little burlap sachets are filled with fresh lavender and require absolutely no sewing whatsoever. They are great for drawers or closets or you could make them up and give them away as gifts. You just make a pocket from the burlap, add your lavender and then glue or tie them together. You can decorate them a bit if you want or just leave some lavender on the outside. 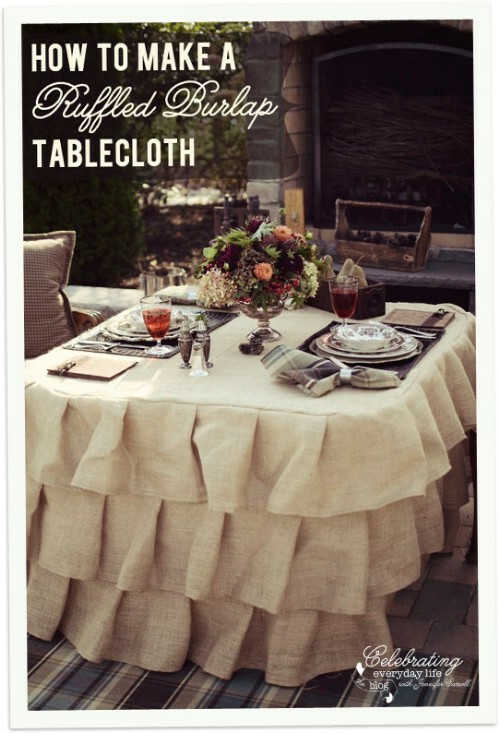 This beautiful tablecloth takes about 12 yards of burlap as well as a few yards of muslin fabric for the underneath. It has lovely ruffles that are perfect for romantic dinners or would look wonderful on your dining room table all the time. You could add lace or another decorative material as well if you wanted but it looks really good just the way it is. 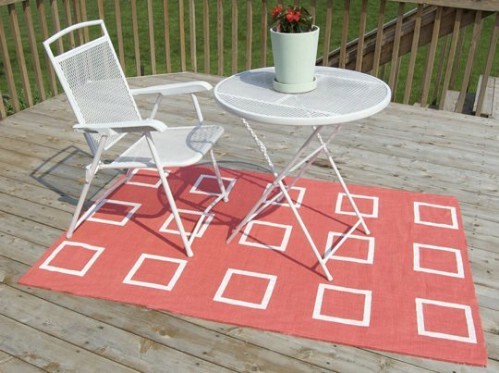 You’ll have to sew a bit but how wonderful would this look on your outdoor dining table? Or you could use it for the Holidays as well. 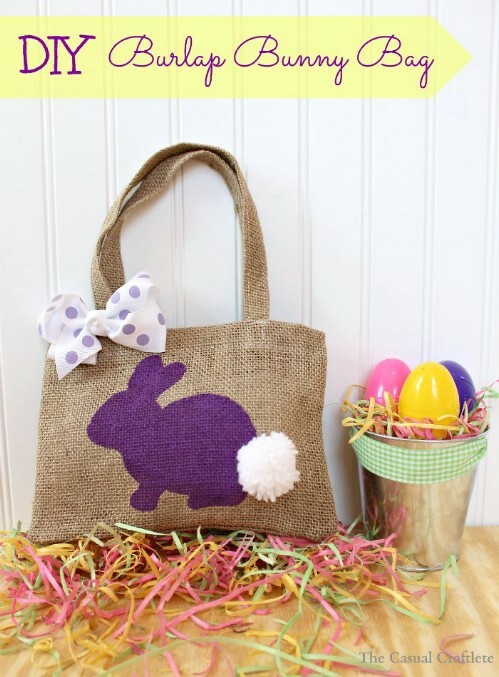 A cute little tote bag complete with a purple bunny (or you could do whatever color you wanted) will look great this Easter. You can use this for Easter egg hunts or carry it as a purse if you want. It’s a relatively easy bag to make and you can even add a cute little cotton tail to your bunny to make it really adorable. 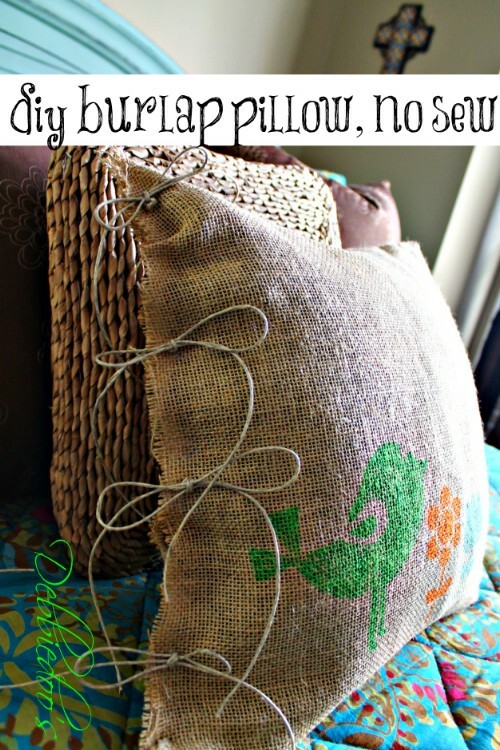 This project calls for a burlap bag that is already made but you could easily make your own and even do these in different colors of burlap to give away as gifts. 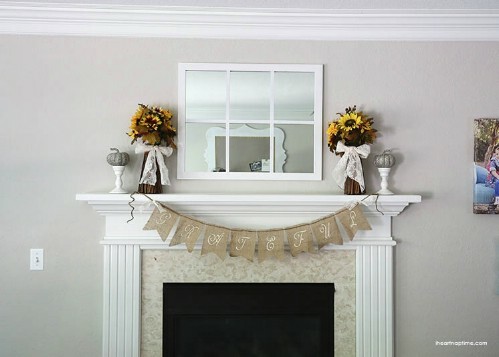 Decorate this fall (or spring, summer or winter) with a lovely burlap banner that you can easily make yourself. You just have to cut the pieces for the banner, stencil in whatever you want to say and then glue some jute or twine to each piece to hold them together and hang them. This would be really nice as a Christmas or Thanksgiving banner or you could easily turn it into an Easter banner with bunnies or anything else you want to add. Make a really nice outdoor rug for your summer entertaining with just some burlap, acrylic paints, stencils and some acrylic caulk. The caulk keeps the edges of the burlap from unraveling and helps to give body to the rug. You can do any design that you want and you could pick up burlap in different colors if natural doesn’t really go with your outdoor décor. This is a beautiful rug and one that takes very little time to make. Add it to your deck or patio and really bring your outdoor decorating to life. 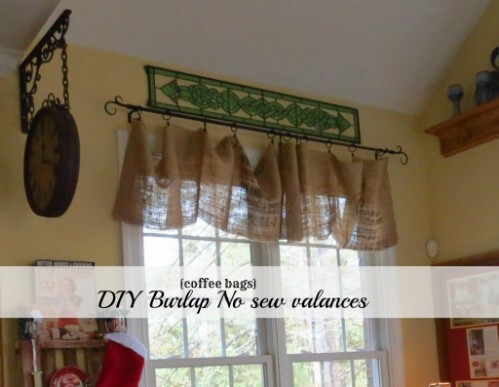 You can find old coffee bags made from burlap easily on the internet and once you have a couple in hand, you can make these adorable coffee bag valances for the kitchen. The gist of the project is really easy. You just have to measure your windows to ensure that you have your burlap the right size and then create the hangers to string the valance up on the curtain rod. You don’t even have to sew. You can use fabric glue if you prefer and the rings can be attached with clips. 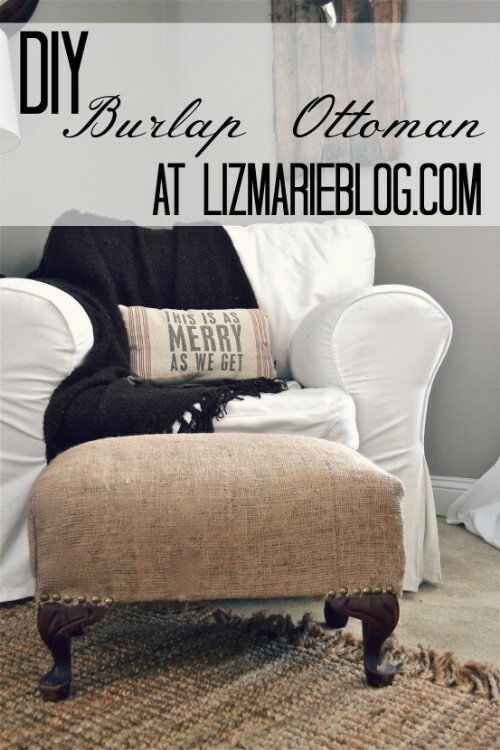 If you have an old ottoman that you need to reupholster, why not do it in burlap? This is a great look that matches virtually any living room décor and is actually much easier to do than you may think. You just have to remove the fabric from the ottoman and then replace it with enough burlap to cover it and have a little extra to tack down on the sides. If you don’t have an old ottoman, you can probably get one pretty cheap at a yard sale or your local thrift store. 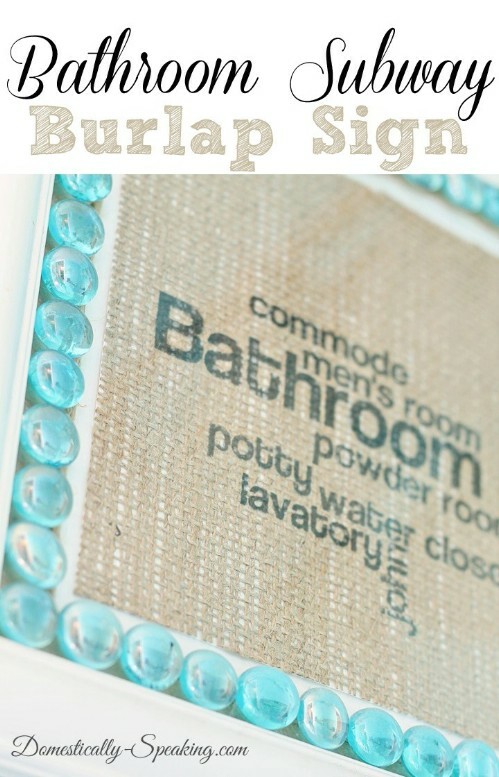 This burlap sign will look great in the laundry room and it’s so easy to make that you can finish it in less than a day. 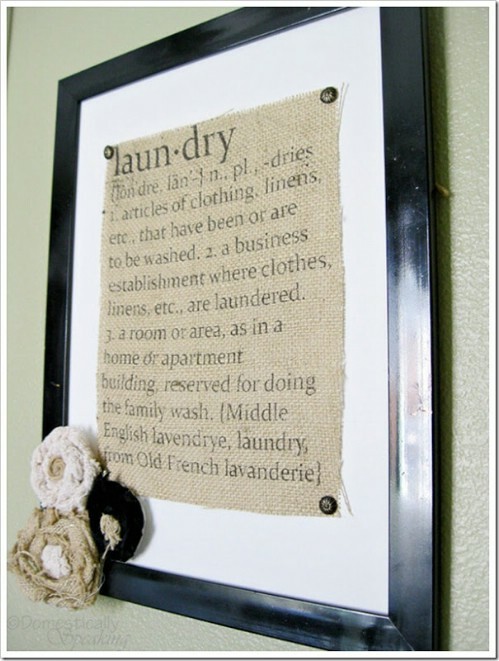 You’ll need a frame to hang it and you will also need to print off the cute little laundry saying directly onto your burlap. Believe it or not, printing on burlap is really easy and you can do it with a normal printer. Once you learn this handy little trick you’ll want to be printing all sorts of things onto burlap. When you have finished with the printing, just frame the saying and hang it in your laundry room. 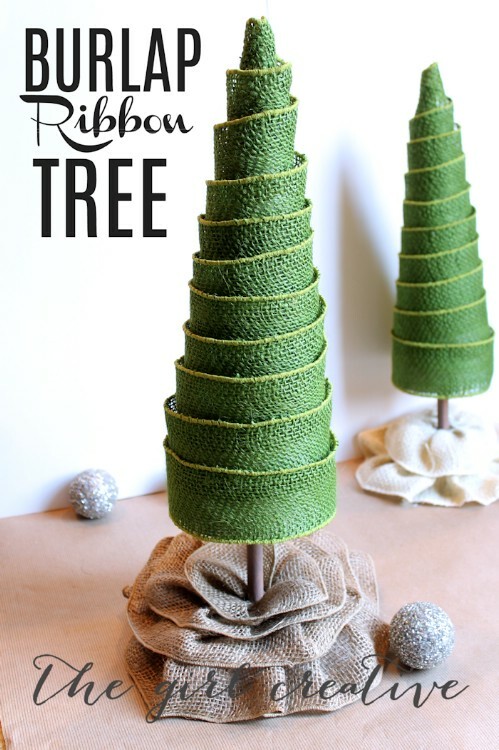 Whether you are decorating for Christmas or you just want something really unique to adorn a coffee table, these burlap ribbon trees are perfect and they are perfectly easy to make. You can use a foam cone or make a cone out of poster board and then just wrap the ribboned burlap around it. You can do these in different colors for spring and summer or keep with classic greens and reds for the Holidays, whatever you want. Wired burlap ribbon works very well and holds in place nicely. Plus, you can get it in tons of different colors. 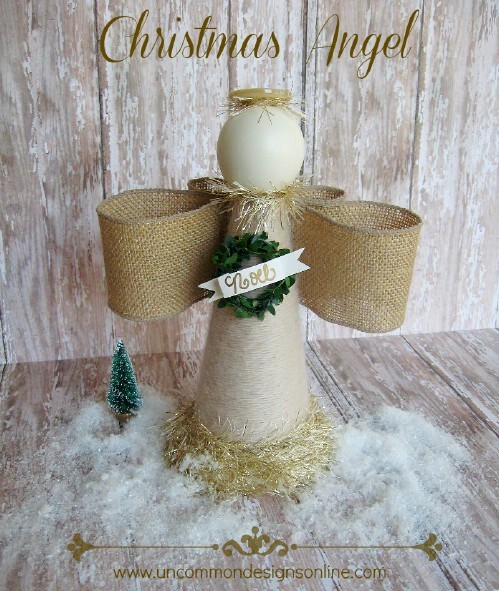 Now is the time to begin making those unique decorations for Christmas and this burlap angel is a must if you love the rustic look. These would also make wonderful gifts and they are really easy to do. Wired burlap ribbon is used for the wings and there are a few other supplies that you will need as well. They are really inexpensive to make and you can decorate them in any number of ways so you can make different styles that are completely unique. These napkin rings are really elegant and perfect for romantic dinners, weddings or just anytime you want something a little extra-special. There are actually a couple of different ways that you can make napkin rings with burlap and they are all relatively easy. 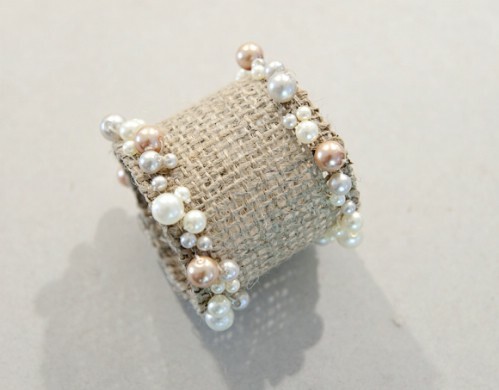 If you like the look of beads, you can just cut the burlap, add the beads and then sew the ends together to create the ring. Sewing will probably work better than fabric glue for this one but you can sew it by hand so no machine is needed. 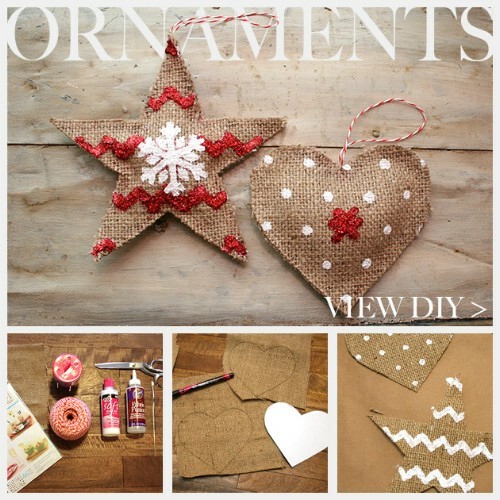 Kids will love helping you to create these adorable country Christmas ornaments with burlap. Imagine your Christmas tree completely decorated with these lovely creations. They are easy to make and you can get several of them from a couple of yards of burlap material. Use glitter, stencils and other adornments to decorate them a bit or you could just leave them plain, whatever you prefer. They don’t require sewing – you use fabric glue instead and then just glue a ribbon, twine or any other string to hold them onto the tree. 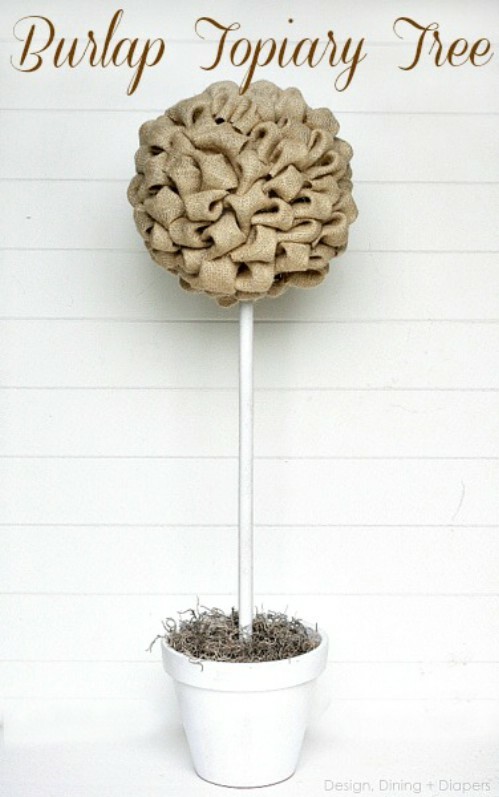 You can create these adorable burlap topiaries in all different sizes so they are perfect for indoors and out. Make a couple of rather large ones for standing up outside your front door or you could make smaller ones to create a beautiful centerpiece or table display. You can add them to a really colorful planter to use in spring or put them in white to decorate during the fall and winter. These are great. They are easy to make and you can do so much with an adorable topiary in terms of decorating. Really set your table nicely with these easy DIY placemats. 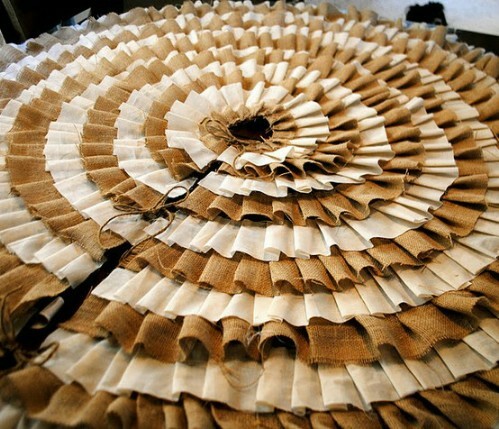 You just cut the burlap you need to the appropriate size, add some fabric glue to the edges and iron – this keeps them from fraying and then stencil in whatever you want. 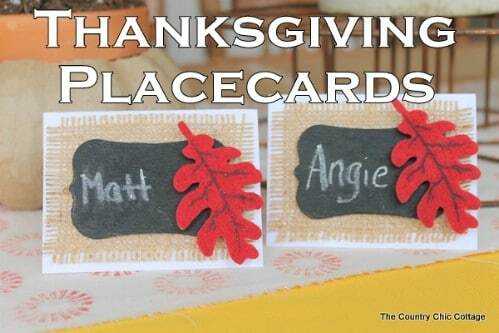 You could create one with each family member’s name for family dinners or make special messages for the Holidays. These are great because they take very little time and very little fabric so you could get several out of a couple of yards of burlap. And, there is no sewing required so they really are easy to make. You still have plenty of time to create this adorable Easter basket wall hanging out of burlap. You can use wired burlap ribbon which is much easier to bend and twist and sticks together pretty well when creating certain crafts. 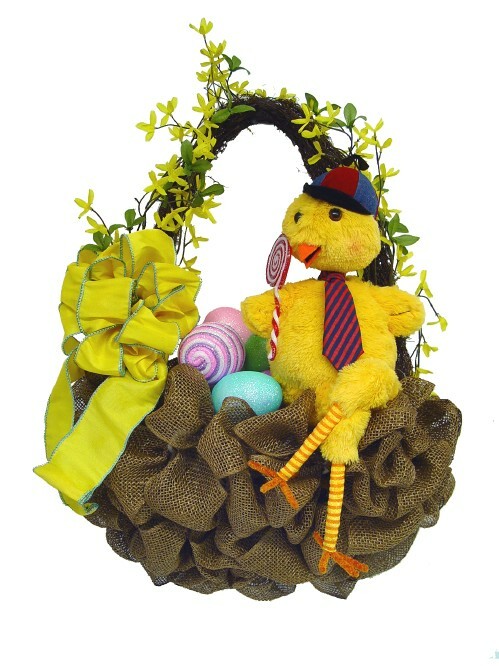 Once you have the basket made, you just decorate with a stuffed chick, bunny or anything else you want to add. This is such an adorable project and so easy that you just won’t believe it. Use this to decorate the door and you could skip the Easter decorations and just use spring colors if you want to leave it hanging all summer. 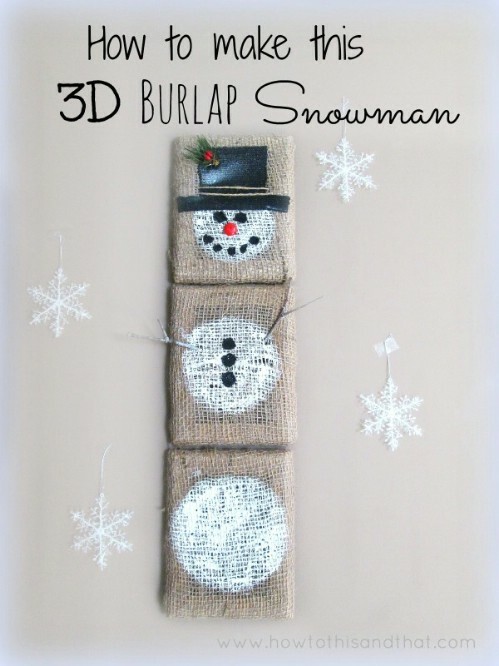 In about an hour or so you can create this 3D snowman wall hanging that would be perfect for your Christmas decorating or you could make a few of them as gifts. You just have to attach the burlap to frames and then paint the snowman on. It really does take very little time and if you have some burlap available and a few small frames, you won’t have to spend anything on this one. You could do them in different characters if you wanted so if you aren’t really ready to begin Christmas crafts, just do summer characters or even an Easter Bunny. This table runner looks really complicated but it is a very easy project. You will need to be able to create the basket weave effect, which is much simpler than it looks. As you go along, be sure to glue down each piece so that they will stay perfectly in place. This is a great runner for dining room tables or you could make them in different sizes for coffee tables, dressers or just anywhere you want them. Make smaller, squared versions to replace doilies. 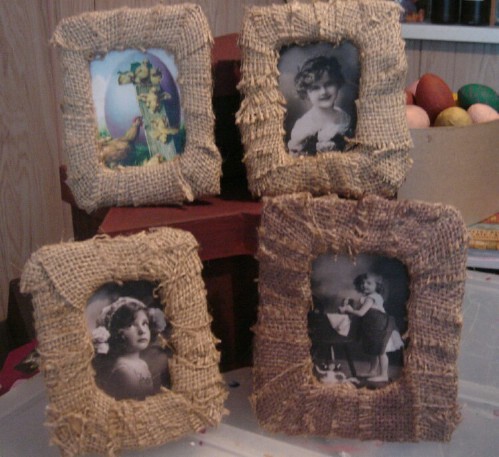 These beautiful burlap frames are so easy to make and you don’t need any wood to make them. You just have to cover cardboard with burlap in order to have lovely frames that look like they cost a fortune. These would make wonderful gifts for anyone you know and they are so easy to make that you can get several done in a day. You also don’t have to do any sewing. 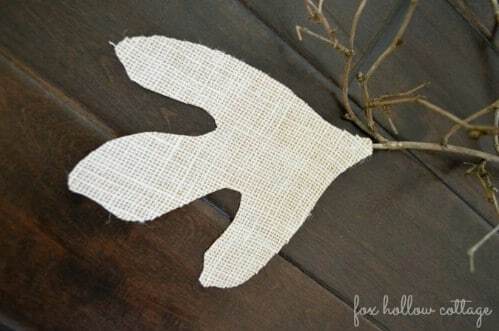 You hold the burlap together with fabric glue and then just add any decorations that you want to make them really unique. 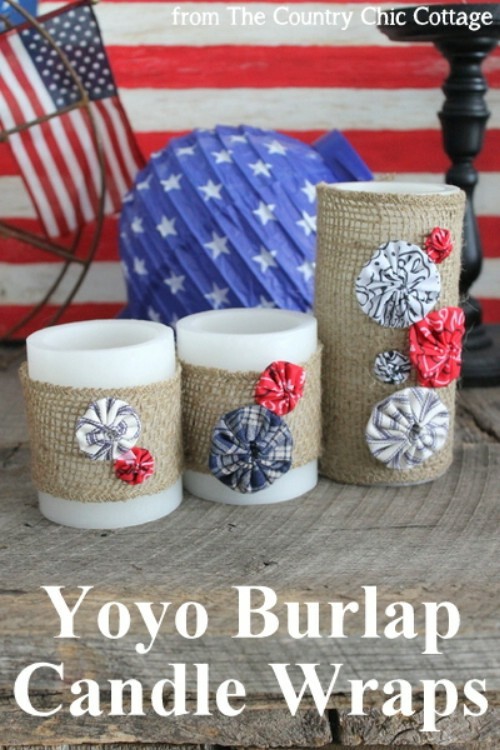 The Fourth of July is coming up and these candle wraps would be perfect for outdoor parties and decorating. Little fabric Yo-Yos decorate the candle wraps which are easy to make from strips of burlap. 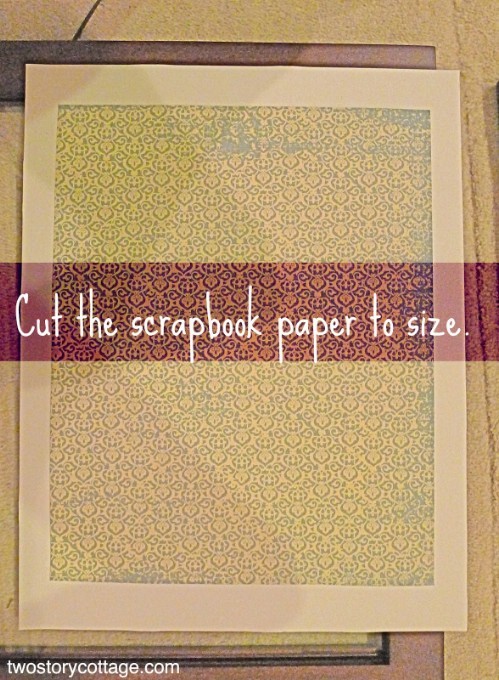 Just choose the size that you need and then cut and use fabric glue to keep the wrap together. Then decorate with the fabric Yo-Yos or you could choose any other form of decorating that you want. You can use traditional glass candle holders or be really creative and recycle some old glass bottles and jars. Monograms are great for decorating your home and this one is done in wood and burlap which makes it really unique and really gorgeous. You will need to purchase a wooden letter (or cut one out if you have the right tools) and then paint it whatever color you want. Get a frame to match or use an old one and paint it as well. The backing is burlap and the letter is raised so it has a great 3D effect. This is really easy to do and would make a wonderful wedding gift if you know someone who is getting married this summer. 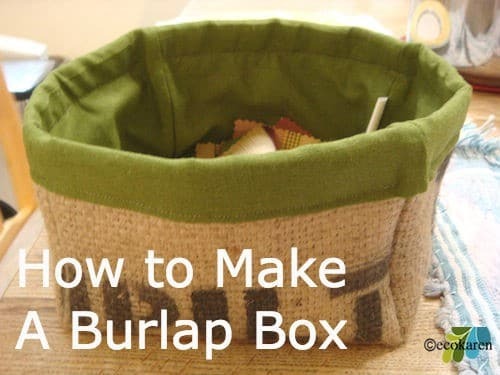 Keep those crafting supplies, sewing or knitting materials or just about anything else you want handy and organized with a great burlap fabric box. Not only do these boxes look great, they are very easy to make. This project requires a bit of sewing but this is an easy one even for beginners. You will want to choose a fabric for the inside of the box and it takes only a couple of hours (maybe not even that long) to create. These are great for organizing the bathroom or using as magazine holders. If you tend to have magazines thrown about (in the bathroom, perhaps), then this magazine rack is a definite must. It is really easy to make and will take you less than an hour from start to finish. 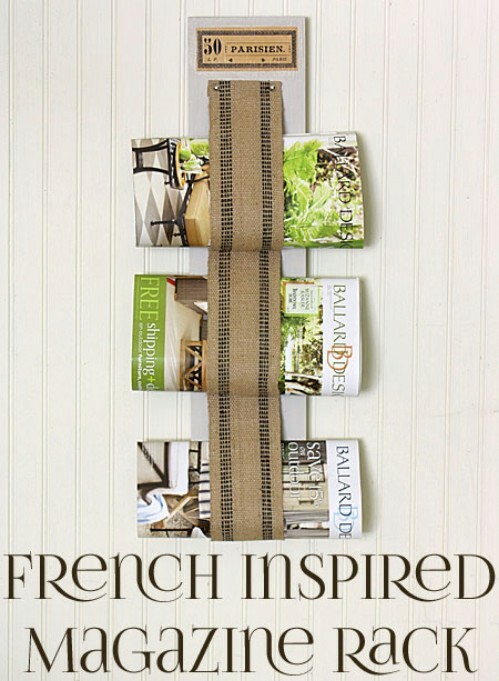 The burlap is folded up so you just roll the magazines up and slide them right into place. You can decorate this however you want but it looks really good in a French design. It’s so easy you may just want to create one for every bathroom in your house or use it in the kitchen to hold all of your cooking magazines. It’s really never too early to begin crafts for the Christmas season. This beautiful DIY ruffled tree skirt is made from burlap and requires absolutely no sewing. It may be a bit time consuming but just imagine how gorgeous your tree will look with this skirt under it. You use a hot glue gun to hold it all together and it works surprisingly well for the ruffles, too. Now, you can buy these online for a little over $100, but why would you do that when you can make one for around $20 or so? 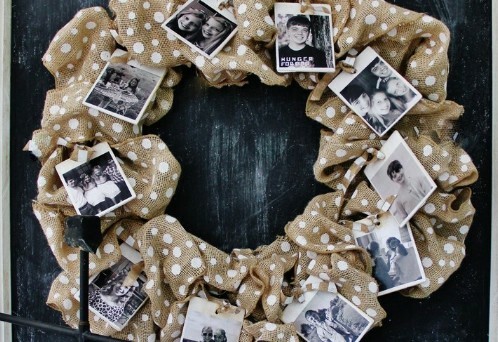 If you are planning to make a burlap wreath, why not really customize it and add family photos? This is a beautiful gift idea if you are looking for something really unique for Mother’s Day or just make one for yourself. The photos are tied on with bows in coordinating colors and the overall look is simply gorgeous. You start with a wreath form and some wired burlap ribbon and from there, you can actually customize it just about any way you want to make it totally unique. If you are looking to redo the bedroom, this burlap headboard is the perfect place to begin. Rustic and charming, you can actually make it in whatever size you need for your specific bed. It is really easy and the completed look is lovely. Add some burlap throw pillows and you can completely change how your bedroom looks in less than a day. It doesn’t take nearly as much material or as much time as you may think to create this look and you can embellish with burlap buttons or just anything you want. 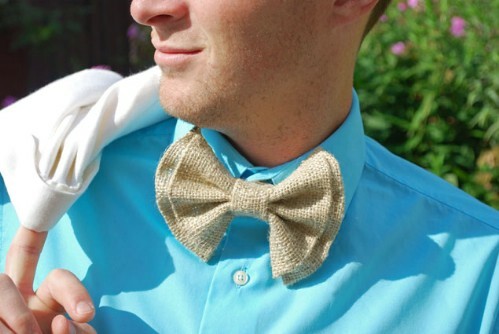 Imagine your country wedding complete with burlap bow ties. These adorable little ties require absolutely no sewing and they are clip-ons so there are no worries of your guys being able to tie them when they are finished. These take so little time to make and very little fabric for each one so if you are planning a rustic wedding with burlap accessories, a couple of yards will go a long way in making all of the bow ties that you need. 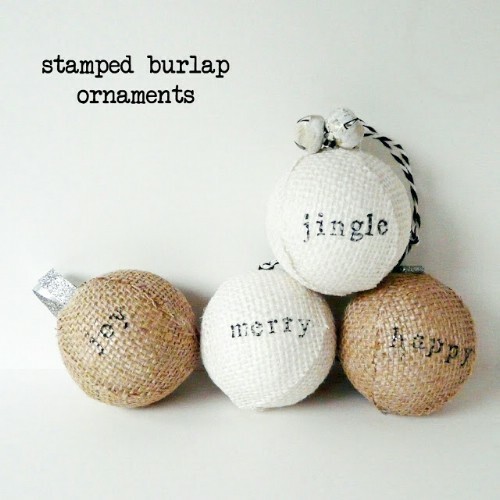 Instead of using the same plain old ornaments this coming Christmas, why not spruce it up a bit by making these adorable stamped burlap ornaments? The project involves putting burlap around foam balls (which by the way are very inexpensive) and then stamping your message across them. You can display any message you want and these would also look great on wreaths or just in a bowl by the front door for added decoration. 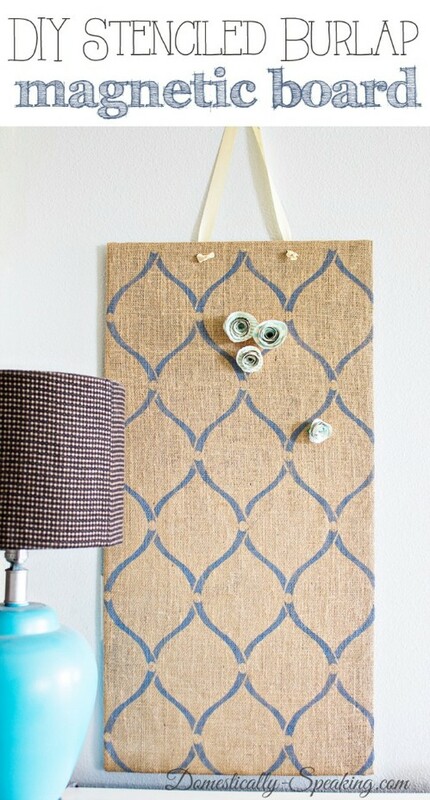 Add a little style to those organization areas with an easy to make stenciled magnetic board. The stenciling makes it as elegant or whimsical as you want it to be so you could use it as an art piece which also doubles as a functional magnetic board. Just stencil in whatever pattern you want and if you want, you can add a few embellishments made from burlap like flowers, ribbons or bows. Tie a ribbon or use twine to give it a hanger. 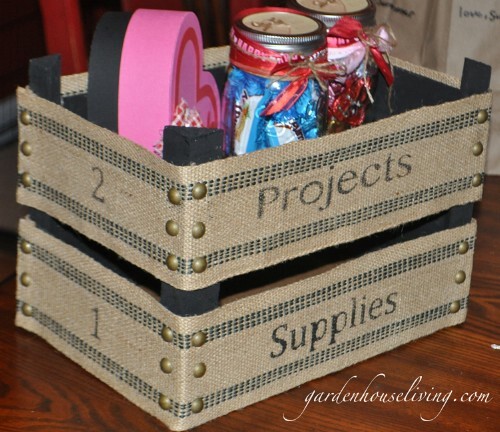 What better place to store all of those crafting supplies than in a great DIY burlap bin? This is a really easy project that won’t even take you a day to complete and once you are finished, you will have a wonderful place to store just about anything. A little burlap, some upholstery tacks and some small wooden bins (think the types that oranges come in) and you’re all set to create an attractive bin that could be used for any number of organization projects. 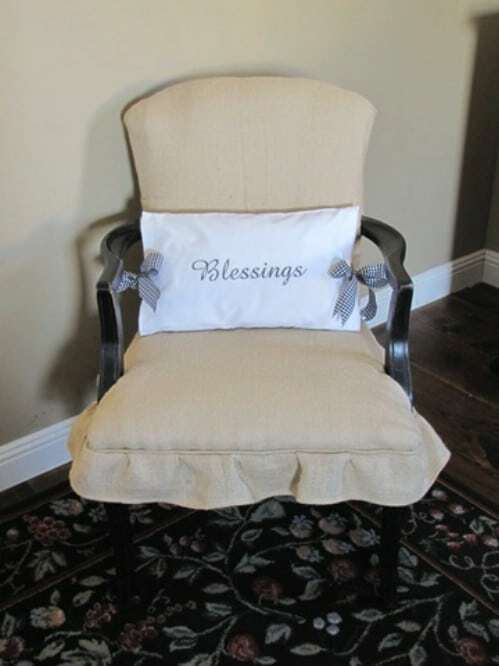 Twine bows are used to hold this adorable burlap pillow together so there really is no sewing involved. It’s a great project if you have a couple of hours to spare and the time really depends on how complicated your stenciling is. If you just want a small picture or message, you can finish this up in less than an hour. The twine around the edges is a really nice touch and it gives it a great country feel and all with absolutely no sewing required. Forget paying hundreds of dollars for a Dior original. You can make this adorable coffee sack purse yourself for less than $10 – depending on the materials that you have on hand. You will need an old book for the supporting frame and then you just have to sew it all together. It’s actually a lot easier than it looks and you will end up with a bag that very strongly resembles Dior’s coffee bag purse only you’ll have a few hundred dollars left over. 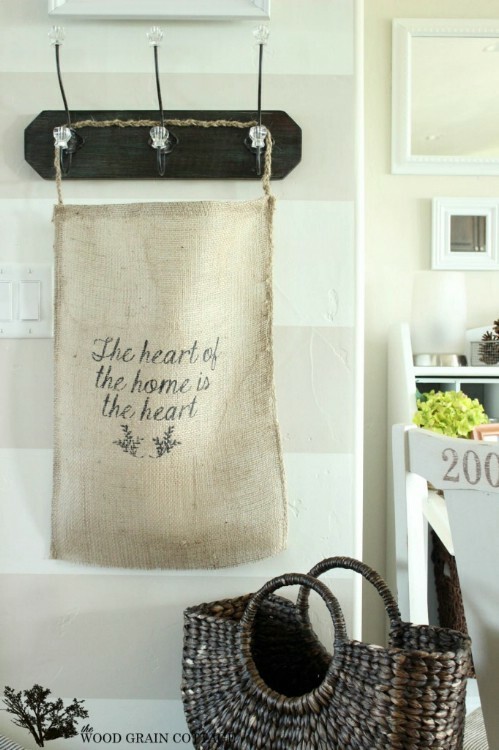 If you’re not a fan of the coffee bags, just use plain burlap and maybe a few stencils to get the design that you want. 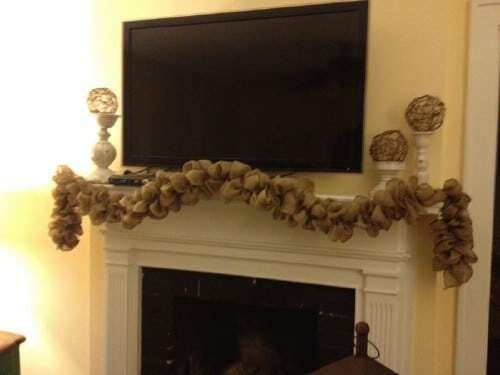 To create a lovely burlap garland, you really don’t need anything except the wired burlap ribbon and some string for hanging. You will need something to weave the ribbon in and out of the burlap but you can use a safety pin or bobby pin for that. Then just bunch up the burlap to create a great poufy ruffled look and tie it up. You can use this for Christmas decorating or just have it on the mantel whenever you need a little extra something. 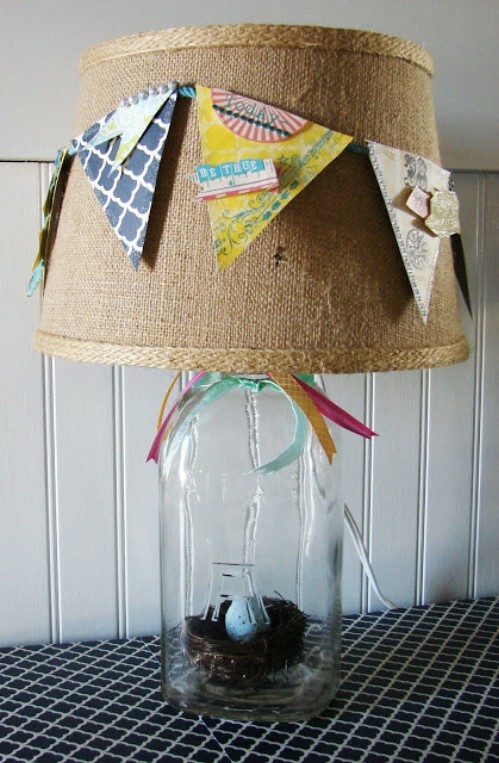 A mason jar is the base for this adorable lamp that has a burlap covered lampshade. While you can buy a lampshade in burlap, it is a lot cheaper to just cover an old one yourself. The best part of this little lamp is the spring themed banner than runs along it. Colorful ribbons complete the look. You could also have spare banners in fall colors or in a Christmas theme so that you can change it around whenever the seasons change. If you want a really easy sewing project and you are in the market for a new purse, this shabby rose purse is a great choice. 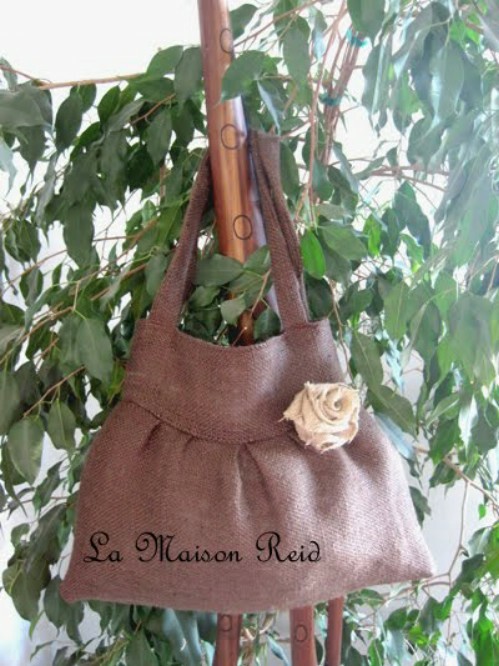 The rose is made of burlap and in a contrasting color, it really stands out. You can complete this project in a weekend or even in a day if you are quite the seasoned sewer. It would make a wonderful gift for someone who likes things on the unique side or just make it for yourself. It has loads of room on the inside and is much easier to make than it looks. 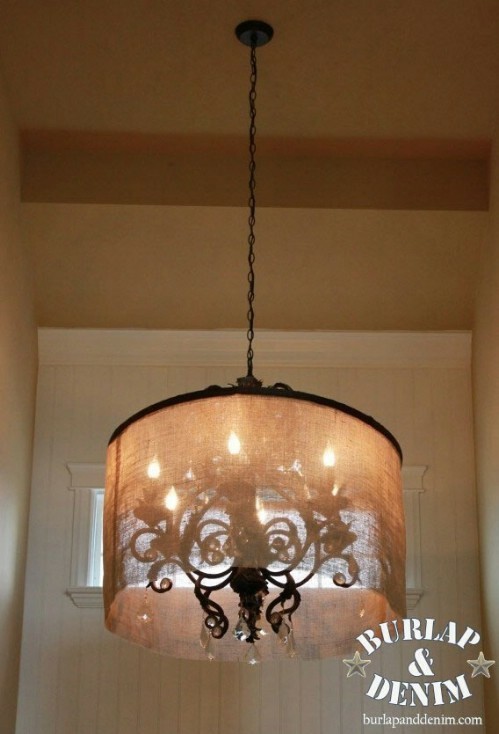 While you may not be able to make this entire chandelier, you can certainly make the barrel shade that covers on it. The shade is completely covered in burlap which makes it both elegant and rustic at the same time. You may be surprised at how easy it is to create this look, which would be perfect in a foyer or formal dining room. The entire look will cost you less than $15 and take only about an hour or so to complete. 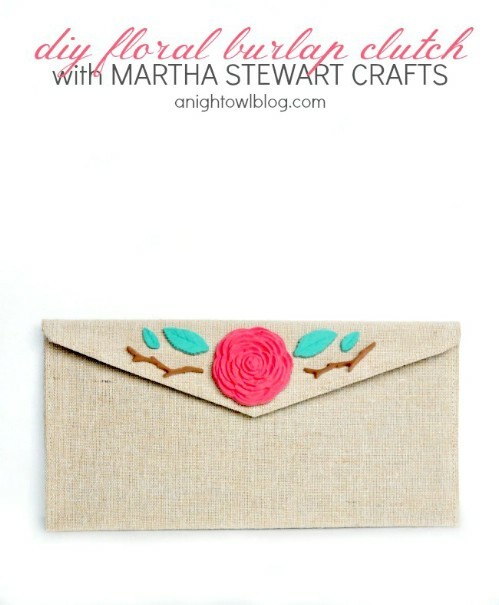 This lovely clutch is both simple and inexpensive to make. You can do it in whatever colored burlap you have on hand or whatever you want and then create the flowers in contrasting colors to make them stand out. This is a great bag for evenings out and easy enough for teenagers to make just in case your daughter wants to create something special for prom. The shape and size of an envelope makes it perfect for times when you don’t have a lot to carry with you. 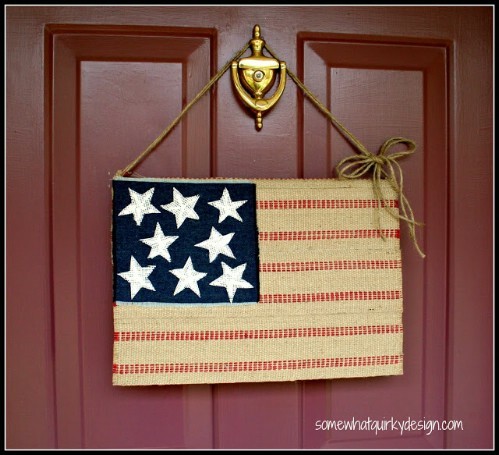 Dress up your front door for the Fourth of July with this great patriotic burlap flag that you can make in less than an hour. You will need a bit of burlap and some blue fabric – denim works really well – as well as the cover of a hardback book to create the shape. You just create a flag with your material and then hang it with twine or another similar material. 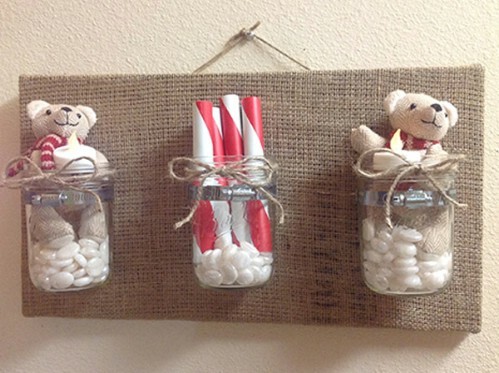 This is actually great for displaying all year and is so very easy to make, not to mention very inexpensive. 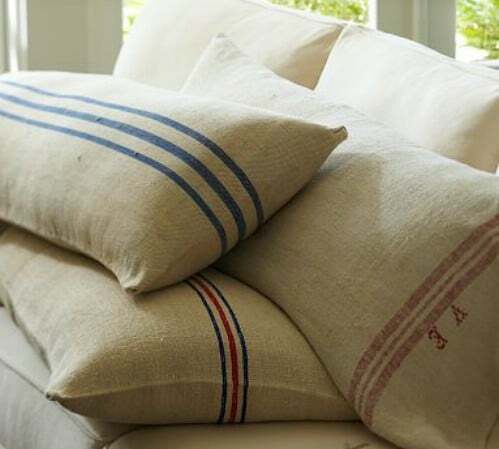 You don’t actually have to find vintage feedbags to have pillows that resemble them. You can easily make them yourself and dress up your bed in a great rustic way. 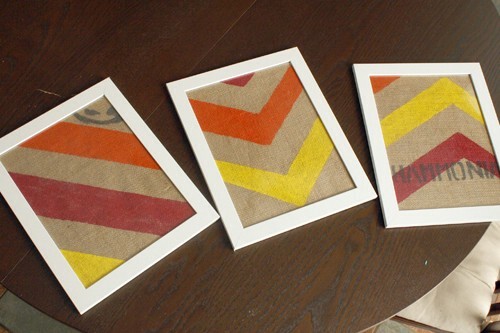 You will need to paint the lines so that they resemble vintage feedbags and these work great with burlap. Then just sew the ends together, stuff with whatever you prefer in your pillows and seal it all up. 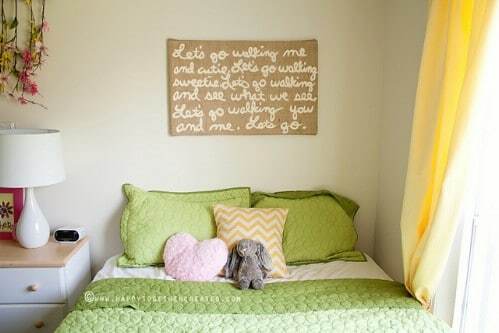 You can also use stencils to create whimsical or vintage sayings on the pillows so that they really look authentic. This rustic looking basket would make a wonderful hamper in your bathroom or bedroom or you could make a smaller version and use it for magazines or anything else you need. You just line the inside of the vintage wire basket with burlap and then add any decorations or adornments that you want. If you are using it for décor, just add a few burlap pillows to the top and you’re all set. You could also use it for a gift basket and fill with various other burlap type décor. A few up-cycled tin cans and some burlap will give you all you need to create this beautiful garland that you can actually plant flowers in. This would look great anywhere that you need to add a little color or greenery. You could use it in the kitchen for growing herbs or hang it on the porch with seasonal flowers in it. Make sure that you clean the tin cans really well and use a can opener that removes the complete top so that there are no sharp edges. Then just cover with burlap and hang with twine. 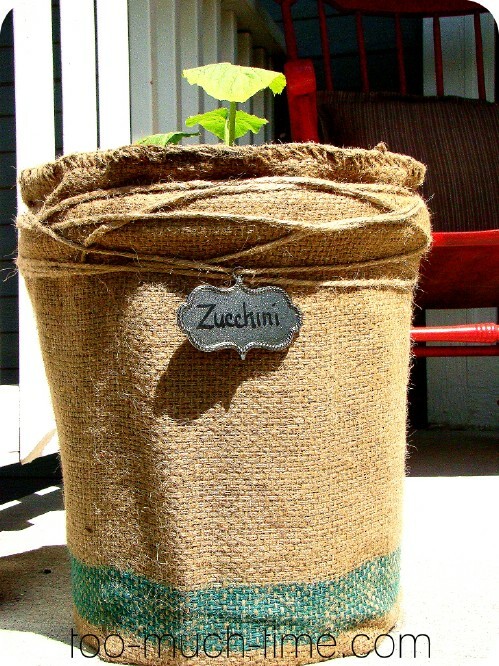 These burlap flower pots are the perfect way to keep your plantings organized this spring. You can use them for flowers or even vegetables or herbs. You just cover a five gallon bucket with burlap, secure it and then label your pots however you want. Hang some twine around the bucket to hold the label in place and your plants will remain perfectly organized so you’ll always know which ones are which, even before they begin growing. This is a great idea for yards that don’t really have garden space. In just a few minutes, you can cut out multiple leaves from burlap to create gorgeous fall decorations. You merely have to trace the leaf shapes and then cut them out. If you love using mod podge, you can use that to hold your leaves onto real twigs or anything that you want to decorate for fall. String them all together and create a banner or just have multiple twigs in a glass vase and display your leaves in their natural habitat. This is a great little project that will help you along with other projects. Save those empty wine bottles this spring and by summer you could have several gorgeous burlap tiki torches lighting up your outdoor living spaces. If you paint the bottles before you begin, you could have very colorful lighting or you could leave them clear – whichever way you prefer. Make a few burlap flowers to decorate them and then simply create the tiki torches which you can use on your outdoor table or affix them to poles and stick them all around your yard. Burn citronella oil in them to get a nice glow that also wards off pesky bugs. 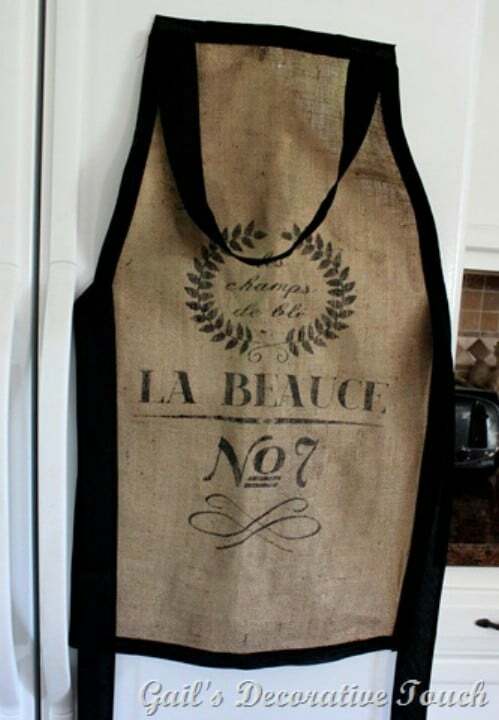 You can make this really great baker’s apron with no sewing whatsoever. You simply have to cut the burlap (you can use a burlap bag to get the writing that you want) and draw in armholes to cut out. Then just cut out the apron form and use a good fabric glue to attach the black seam. This will also keep the burlap from fraying and it looks great as a contrasting background. These would be perfect as gifts for anyone you know who loves to bake or make one for the special Dad in your life for Father’s Day – he can do all of his grilling in style. Instead of throwing out that old chair that seems to be falling apart, why not reupholster it in burlap? If you don’t have an old chair to use for this project you can probably pick one up at a flea market or yard sale for really cheap. Reupholstering is much easier than you may think and when you are finished you will have a beautiful chair that looks great in any room. Add a burlap pillow and it will look even better. Take that old lamp that is in serious need of a makeover and create this beautiful flowered lampshade. You can use a new lampshade too if you want. 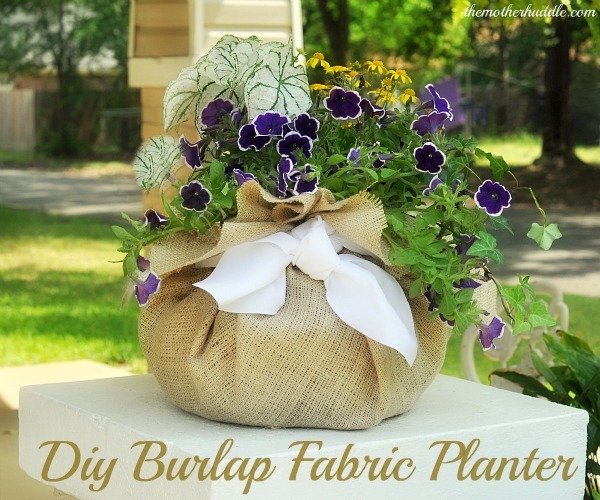 Just create the flowers from burlap and then cut a thin strip for the top and bottom to bring it all together. You can glue the flowers and accents on with hot glue and even cover the entire lampshade if you prefer. This would be great done in different colors of burlap to really make the flowers stand out or you could just stick with a neutral color. 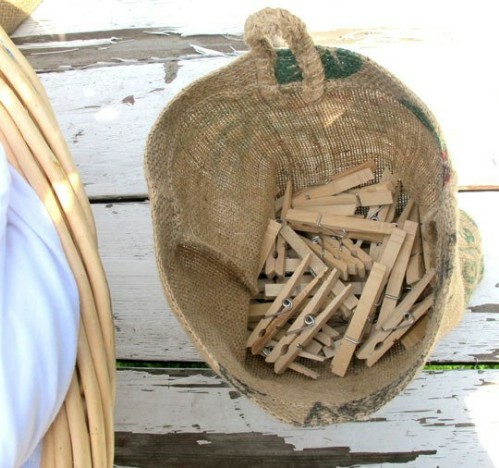 If you love drying clothes outside when the weather permits – not only do they smell wonderful but you can save a lot of energy this way – then you’ll definitely want to put together this burlap clothespin bag. It hangs right on the line so your pins are right there where you need them. You don’t even have to sew this one. 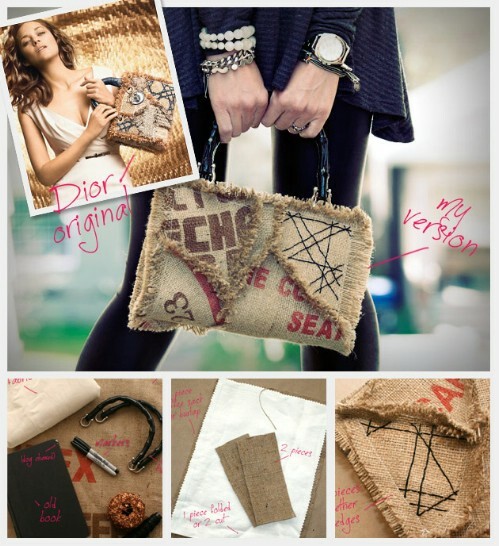 You can use a burlap coffee bag that’s already put together or use fabric glue. After all, those clothespins really don’t weigh that much. Table runners are great for decorating and this fringed burlap runner will be a beautiful addition to your dining room table. You simply have to cut the burlap to fit the length that you need and then go through and fray the edges a bit, tying them off so that they don’t continue to fray in the future. This is a really simple project and tying the frays is actually the most time consuming part. You can easily finish this in a weekend and although there is a little sewing required, there’s not much so even if you are new to sewing, this is a great project for you. 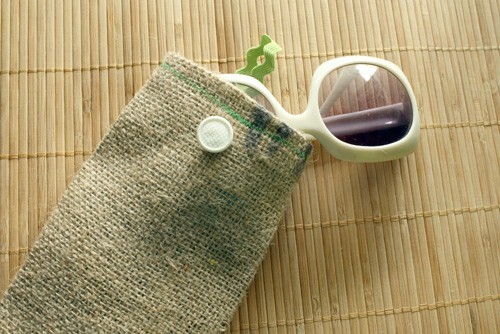 Keep those sunglasses safe and clean with a burlap sunglasses case that you can make yourself in just about an hour or so. This project requires a bit of sewing and you will want to choose a fabric to line the case so that your glasses don’t get scratched. You can choose whatever way you want to close the case but button closure on the front of this one works really well and is relatively easy to create. These would make great gifts so if you want something really unique for someone special, make them a burlap glasses case. They are sure to love it as much as you do. Chevron is a very popular design these days and if you want to add a bit of this design into your décor, these burlap paintings are a great way to do so. 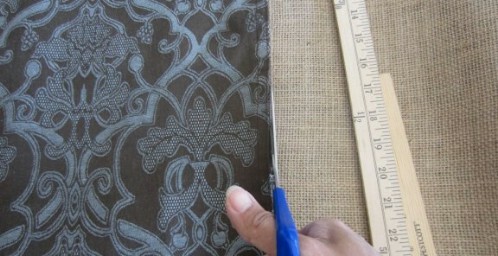 You just have to create the design on your burlap and then frame your finished result. These can be done in any color you want and they are so easy to do. Make them in whatever size you want, use whatever colors you want and you can even toggle the size of the design a bit, too. Create a beautiful canvas for your home with burlap, a store bought canvas and whatever design or message you want to display. 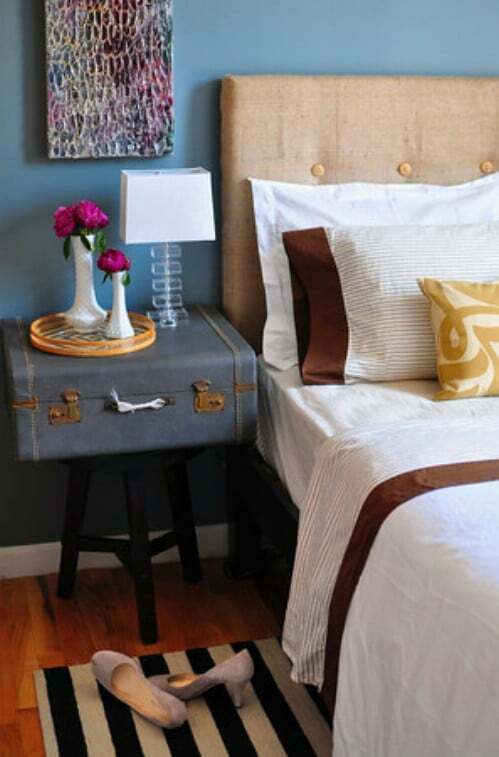 If you are redoing a specific room in burlap, these canvases are a must. You simply cut the burlap to cover a canvas (or several of them if you want something really large) and then paint on the message that you want to display. This is one of the easiest projects ever and it allows you to be completely creative. 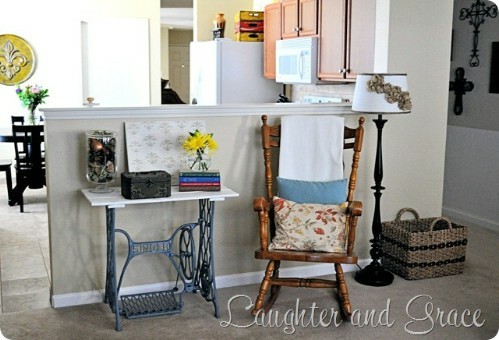 You could use stencils or just freehand your message to make it look really rustic and charming. Ok, so you don’t have to use these only for Thanksgiving but they will look great on your holiday dinner table. 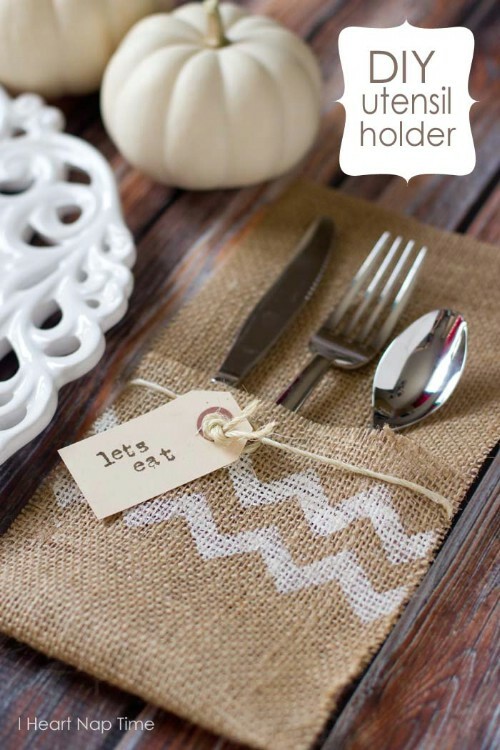 These burlap place cards are very easy to make and will take very little time so even if you are planning to have several guests for dinner, you can easily make a place card for each one of them. The center is made from chalkboard paint so they are easily reusable with other guests and you can embellish them with leaves or just anything else that you feel like using. 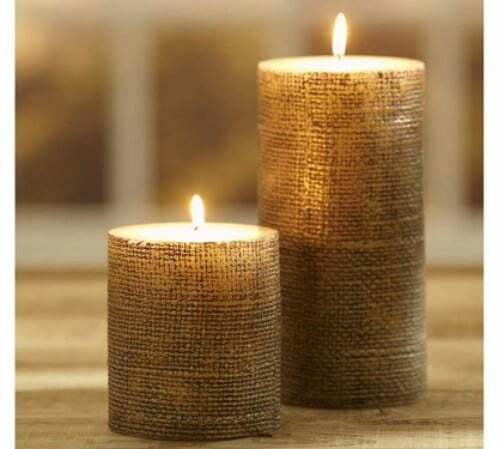 If you love Pottery Barn but just can’t bring yourself to pay some of the prices there, you are going to adore this Pottery Barn knockoff candle made from burlap. You can do these in any size you want. You just have to have a candle on hand that you will cover with burlap. Mod podge holds the burlap in place and once you have the burlap on, you just paint over it with gold paint which gives it that great Pottery Barn look without the cost. Printing on burlap is not nearly as difficult as it sounds and once you master that craft you can create these beautiful burlap prints that can be framed or hung on their own. You could make several of these and use them as gifts. Everyone loves burlap and who wouldn’t love their own framed print in burlap? You just choose the message that you want and then print it off directly on your burlap fabric. It’s really easy to do and it allows you to create wonderful prints and gifts that will take you literally only minutes to make. An old cigar box (a wooden one) and some burlap put together create this adorable jewelry box that will be great for keeping your rings and other jewelry perfectly organized. 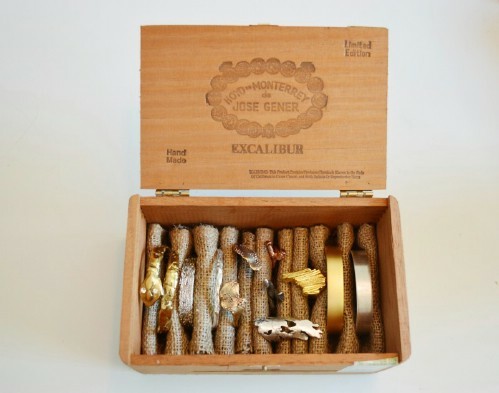 You will need to cut the burlap so that it just fits the width of the box and then cut it long enough so that you can roll it up and stuff inside the cigar box to hold your rings and other jewelry. If you know someone who loves unique gifts, this would be a great one. You can also paint the box if you want but it looks wonderful in its natural color. Subway art has become very popular and what could be better than printing that subway art onto burlap. This bathroom subway art is a beautiful way to decorate the powder room and you can colored stones that you can find at your local craft store to decorate it a bit. Just print the subway art off onto your burlap, frame it and then decorate around it. It’s really simple and something that will take you literally only minutes to put together. Keeping the family organized can be difficult. Most people have a calendar of some sort to help them to keep things together and this burlap calendar is a great choice. 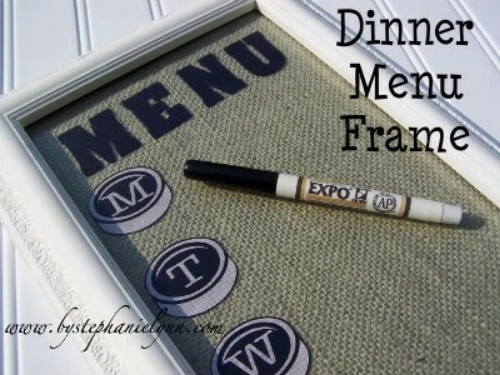 You can draw the calendar however you need onto the burlap and then simply frame it in a glass frame. The glass is easily written on and then erased away if you use a dry erase marker. You can be very creative and choose frames of any color and even add a few embellishments if you want. 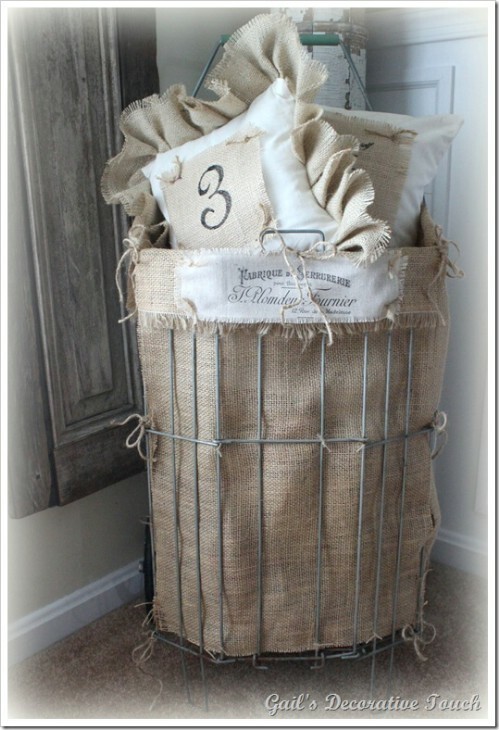 This is a great project for organizing your home and using a bit of that spare burlap as well. Who doesn’t love those handy storage bins? They are after all, perfect for keeping things neatly organized and when you make them from burlap, they are just as decorative as they are functional. You will want to have a few boxes on hand to cover but you can use old diaper boxes or anything that is the size that you need. After all, you will be covering them completely with burlap so it doesn’t really matter what they were in a previous life. Once you finish, you can use these to organize virtually every room in the house. They are easy to make and if you have burlap and boxes, they may not cost you anything, either. 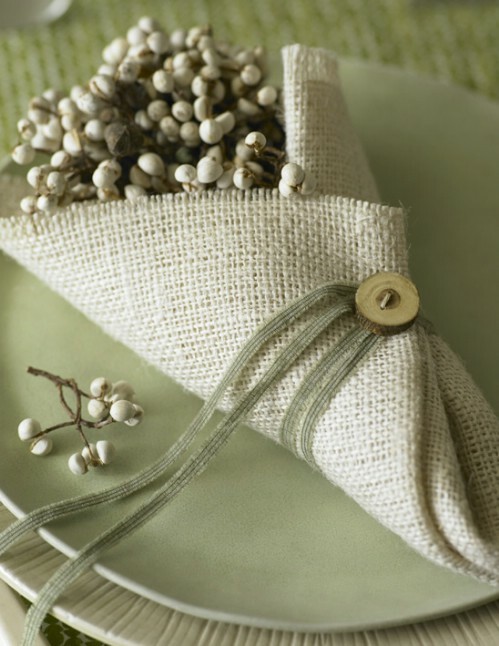 If you are planning a burlap wedding, these little table bouquets will be perfect for decorating your reception. If you aren’t currently planning a wedding, you can still make these and just use them to decorate around the house. They are simply folded burlap with ribbon tied around to keep them in place and then filled with lovely flowers. You can use whatever flowers you want or decorate them a bit of you want. You can literally make these in about ten minutes each so if you are planning a wedding, this is a really quick way to get those tables decorated. 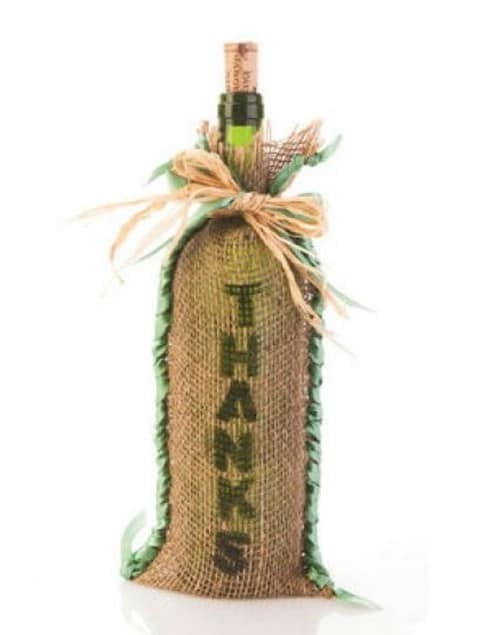 If you love giving wine as gifts, try making these great burlap wine bags to hold that wine. Each bag takes only about half an hour and you can decorate them however you want. 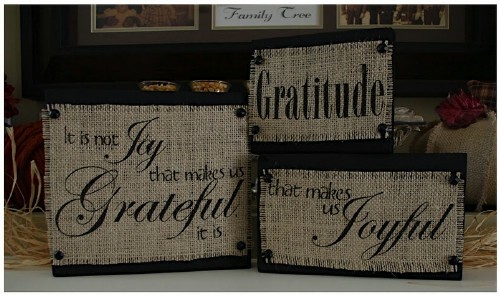 Use stencils to put messages on the fronts or even add burlap flowers or bows. These are very easy to make and take very little material so a yard or two of burlap will make several of them. 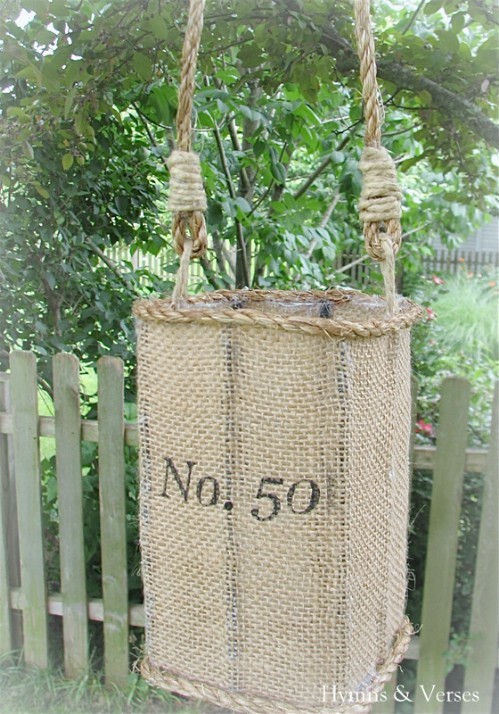 Just tie the top up with ribbon or use twine to really make the bag look rustic. 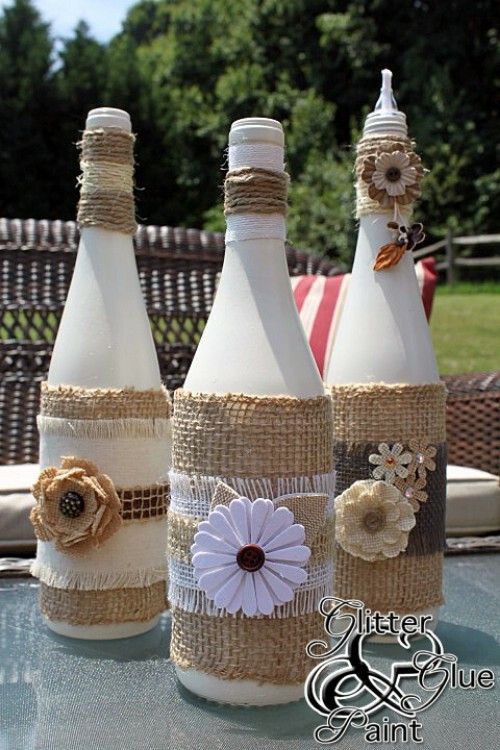 Patron bottle vases are elegant and adorable and you can really dress them up with a little burlap. 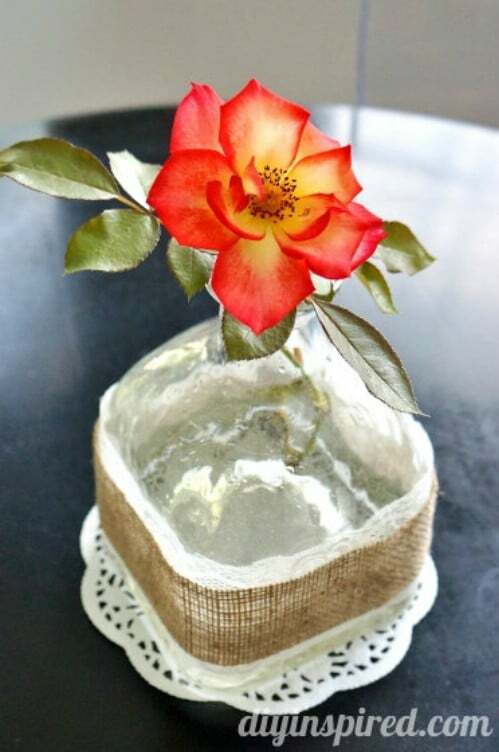 Just cover the vase in lace and then cover the center of the lace with burlap or you could do this vice-versa and put the burlap as the backing. These are great for decorating for parties because they are inexpensive and very easy to make so if you need several, they won’t take days to make or cost you a fortune. Add a flower to each one and you’re all set. 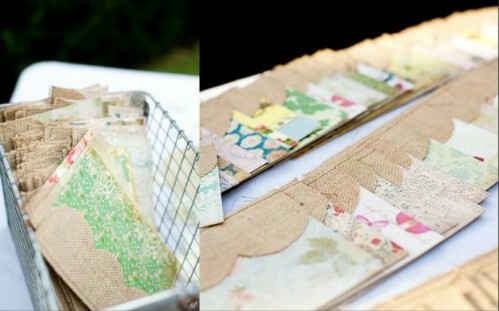 If you are planning a wedding that uses a lot of burlap, why not incorporate the look into your invitations? With some card stock, a printer and a little burlap you can create beautiful invitations that are sure to be a huge hit with family and friends. These are also great for summer parties and other special occasions when you need to send out invitations. You could also use them as wedding programs to let everyone know who is in the wedding and the venue that you will be following. Whether you are planning a burlap wedding or you have a special someone going to the prom, these burlap boutonnieres are a great choice. You can cut the form out of an empty cereal box so if you already have the burlap and a few other supplies on hand, you won’t have to spend anything to make these. You could add baby’s breath or other flowers to them and actually customize them to perfectly match any wedding theme. And, they’re a lot cheaper than boutonnieres that you purchase from the florist. Whether your family is filled with football fans, baseball enthusiasts or any other sport, you can create a wonderful door hanger that suits your family perfectly. 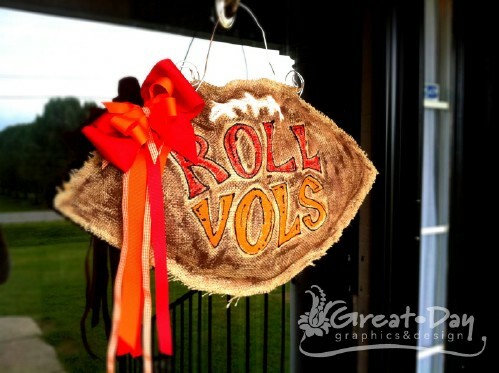 This burlap door hanger is really easy to create and can be completely customized to fit your family’s favorite sport and favorite team. You just have to cut the burlap to match the form that you need (football, baseball, etc.) and then sew it together and stuff. Once you’re done you can decorate with bows or just anything that makes it special. You know how popular gifts in a jar are. Well, this is a burlap twist on those popular gifts. 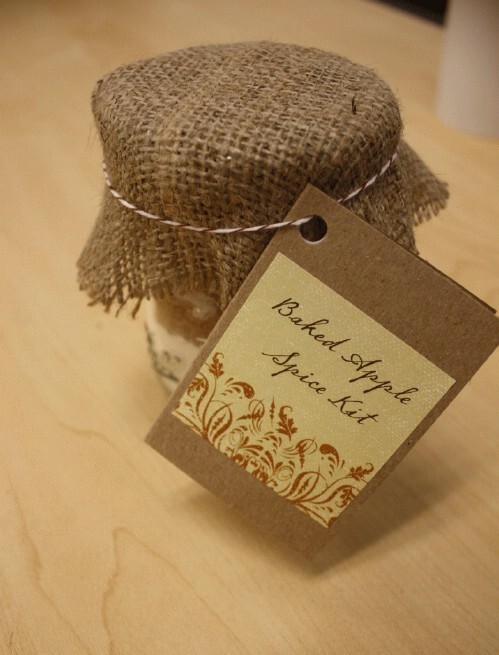 When decorating your jars, add burlap to the top and then some twine or jute rope for tying. You can use smaller jars and give them away as party gifts or create larger ones and use as gifts for special occasions. The burlap really gives the jars a homey look and you can fill them with your favorite recipes or even jellies, jams or any other yummy goodness. Old mason jars and some burlap work really well together in creating this wonderful storage shelf that you can use in bathrooms, kitchens or anywhere you need it. You simply cover a piece of wood with burlap and then affix your jars, which will need to be secured with clamps. These are great for holding Q-tips and cotton balls in the bathroom or you could use them in the kitchen for housing your wooden spoons. The entire project takes less than an hour and gives you a beautiful storage solution. 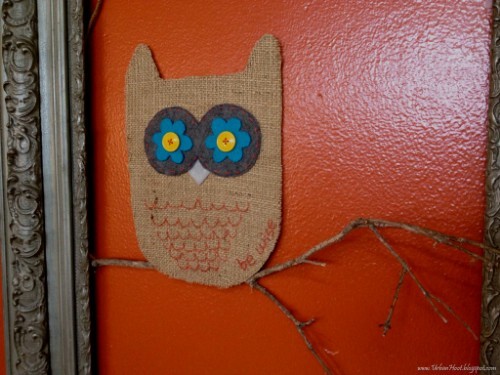 The kids are going to love helping you to create this whimsical owl from burlap. You need burlap, felt and a few craft supplies and then you can hang your little owl on his own tree branch. Frame it and you have a beautiful wall hanging that is sure to bring a smile to everyone who sees it. This project does not require any sewing. You can glue everything together with a hot glue gun and it’s so easy that you may end up adding more than one owl to your little tree. If you really want your pictures to stand out when you hang them, replace the matting behind them with burlap. This is a great way to make your entire photo display look rustic. You can purchase frames at the Dollar Store for around a dollar each and then make them really special by adding the burlap and some scrapbooking paper to create a unique mat for each picture. You don’t have to sew or even glue for this one. Just add the burlap and then the picture and the glass from the frame will keep it all in place. You can create a beautiful Advent calendar using burlap or you could turn this into a Christmas countdown calendar if you wanted. Actually, you could use it as a normal calendar if you want, just be sure to add a label for each month. 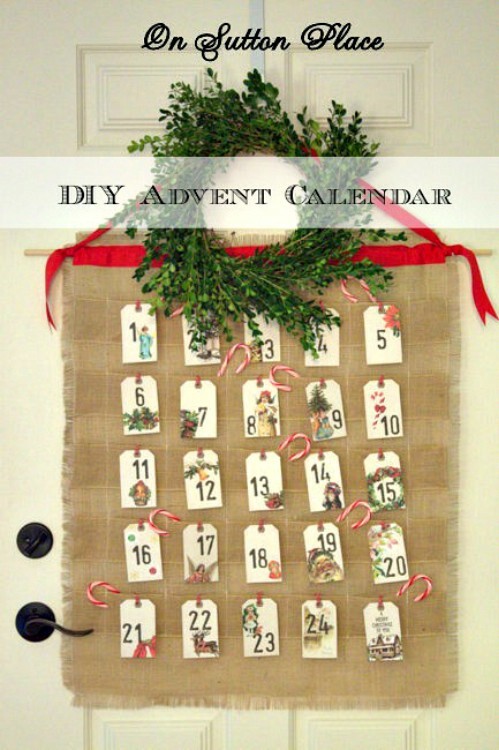 If you are making and Advent calendar, you can fill the numbered pockets with small candies or gifts or use plain labels instead of pocketed ones to create a regular calendar. Either way, this is a really easy project and one that won’t cost much, either. 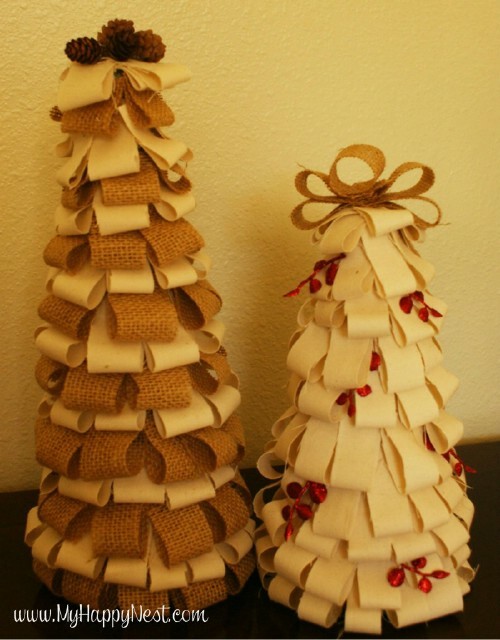 These beautiful burlap Christmas trees are inspired by Pottery Barn but they cost much less. You can do these in alternating colors or alternate the burlap with canvas to make them a bit unique. You can make them as tall or short as you want, depending on the size of the cones that you use and you can make them fuller by simply adding more fabric. Once you’re finished, decorate if you want or just leave them plain. There is no sewing required so this is a project that everyone can do and the kids will love to help with it. Ok, so this is not technically a décor project but it’s a very helpful one anyway. 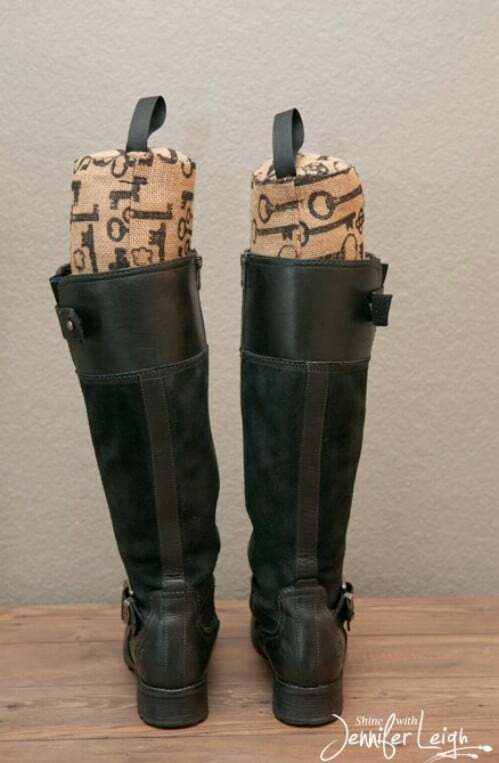 These burlap boot stuffers are great because they are quick and really inexpensive to create and they work perfectly for keeping your boots from drooping. Two boot stuffers takes only a yard of burlap to create so you can make several of these if you have more than one pair of boots. These are also great for gifts and there is very little sewing required. I am trying to learn,to use my kindle. Cada trabalho mais lindo e criativo do que outro. Parabéns. Very nice reuse of the product…. Any one looking for real coffee bean burlap sacks I have a lot of them from all over the world. Tim. How much do,they cost? Can you send some photos? yes I am 3176040881 about ten of them. Yes…I would to see this.